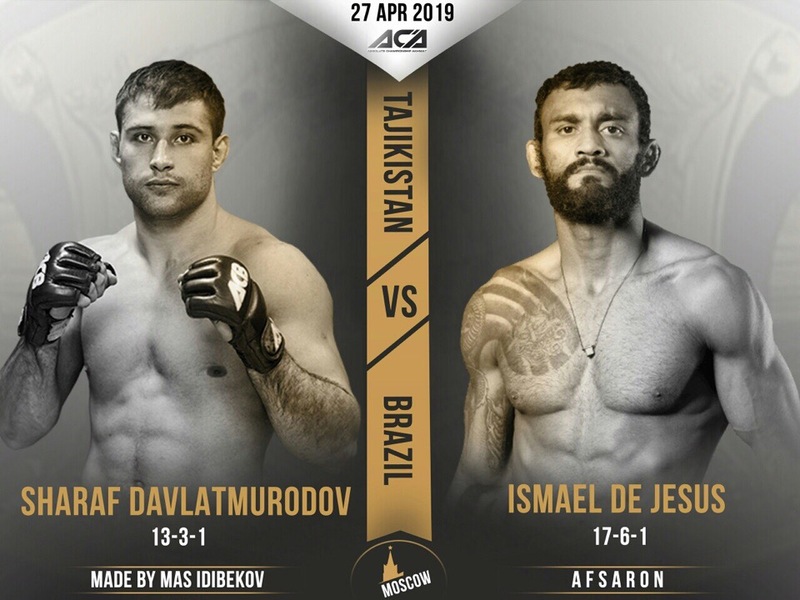 Strela Team fighter Sharaf Davlatmurodov (13-3-1) is going to meet his opponent Ismael de Jesus (17-6-1) at ACA 95 on April 27, 2019. Welterweight category. 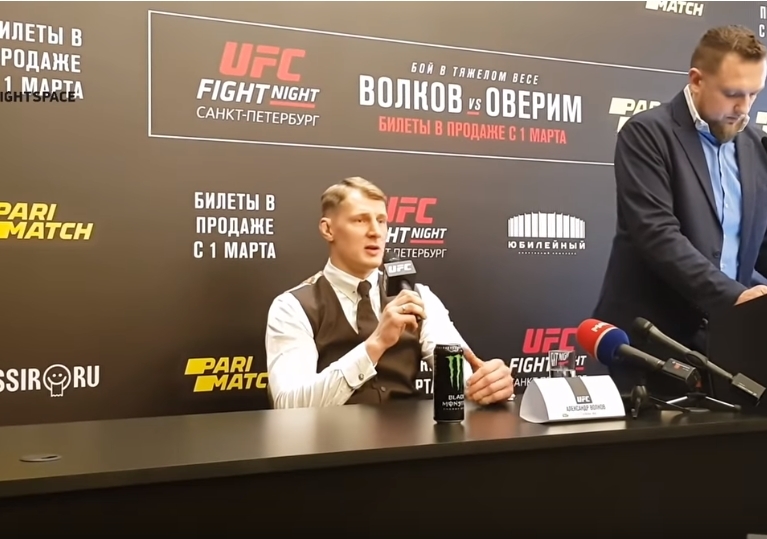 Alexander “Drago” Volkov at the press conference devoted UFC FIGHT NIGHT St Petersburg Russia to April 20, answered questions from the press. Volkov is now ranked 5th in the heavy weight rating, and Alistair Overeem 6th. 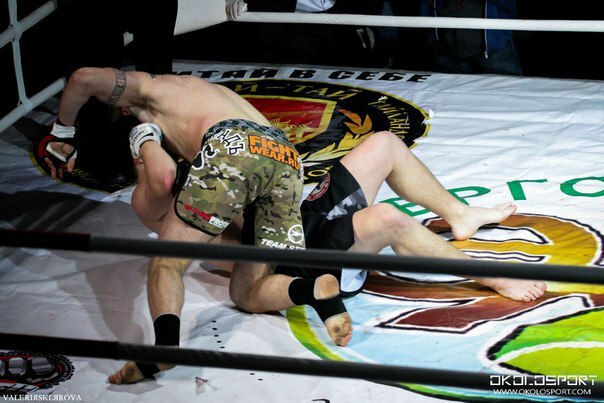 The last fight for Volkov was unsuccessful. He lost to Derrric Lewis at the end of the 3rd round of an almost won fight. It is a great honor for me to lead the tournament in Russia. And with honor comes a great responsibility, so everything that depends on me, I will try to do. I have no escape route. I will go, I will fight. When you started your way as a fighter, was Alistair Overeem an idol for you or was he just a fighter you were targeting? I will tell you even more interesting fact. When Alistair Overee won his 1 pro fight, I spent my 1 amateur fight at 11 years old. That is, between us there really is a gap in the generations of speeches, in the generations of fighters. I will naturally worry. I will very much wait for this fight. Alistair Overeem was one of my favorite fighters. I have been following him for a long time as an MMA fighter, as a K-1 fighter who became a champion. For menga this fight will be a kind of test. What I have achieved during this time. What are you going to do if Alistair Overeem starts to deal with you, post some funny photos about you and so on? I do not know what I will do. But I’m definitely not going to jump over the octagon after the fight and beat its seconds. And so if it stirs interest, then let it be. Fight with Overeem. How much does he promote you in the UFC rankings, does he approach the title fight? Overeem is probably now one of the most titled fighters in the world, a veteran, a big name with him. Victory over him will help me close my previous unsuccessful performance. Of course, I do not count on the title chance immediately if it happens. But one victory after that I will be enough for me to fight for the belt. It will also depend on how the fight goes. But in this respect, Overeem fits very well. He is a drummer, textured, shows spectacular fights. From this point of view, this will be a very useful fight for me. In Russia, Overeem is very popular. Accordingly, the fight will attract a lot of attention. 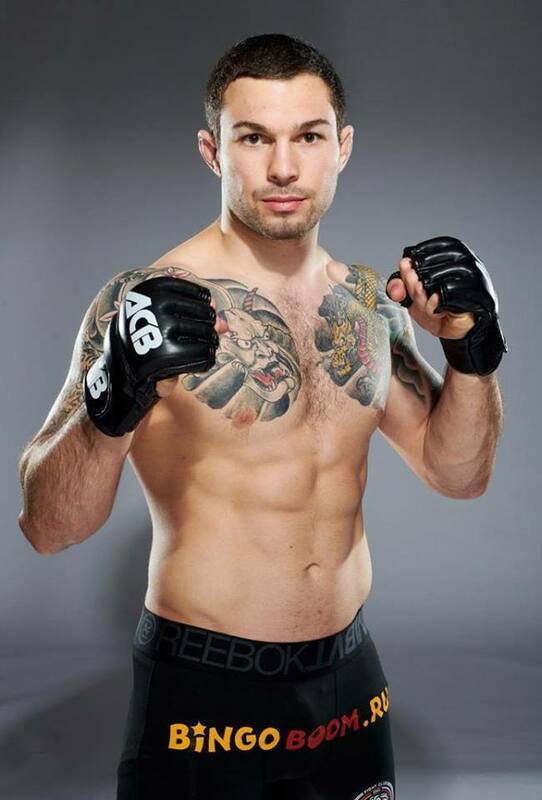 The UFC made the right choice by putting this opponent against me. UFC has announced it will host its event in Saint Petersburg, Russia, on April 20, 2019, at Yubileyny Sports Complex. Russian heavyweight Alexander Volkov (30-7; Strela Promotion team, Moscow, Russia) will face UFC veteran Alistair Overeem (44-17; Amsterdam, The Netherlands) in a great bout. 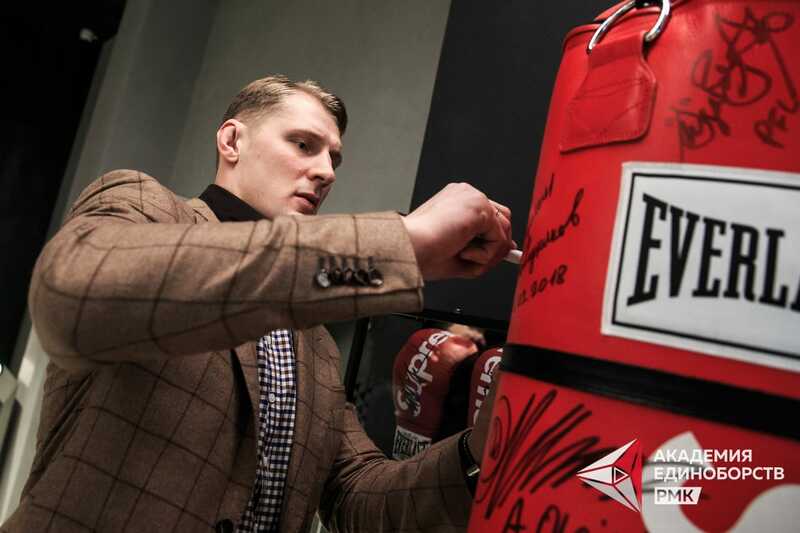 Volkov can pave his way for the title fight in case of a win over Overeem in his home country. Heavyweight fight added to ACA 95 fight card: Sergey Bilostenniy (Strela Promotion, 5-2) vs. Mark Godbeer (13-4). 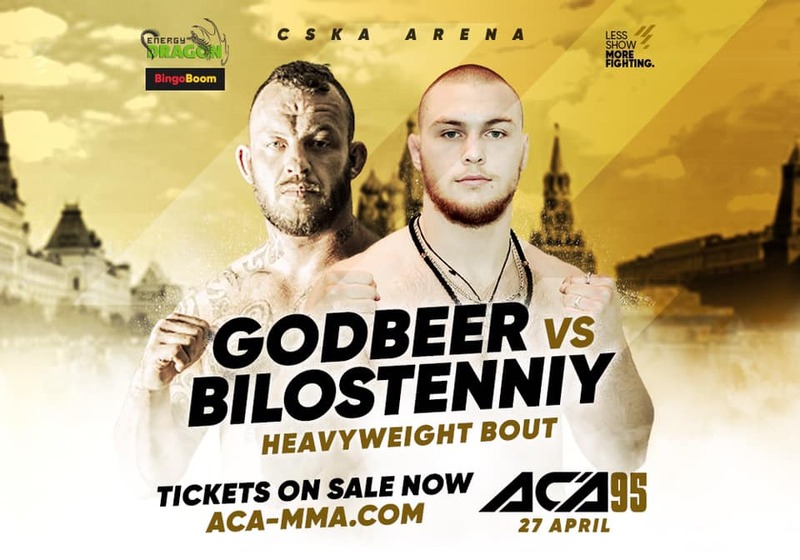 ACA 95 is scheduled to do down on April 27th, 2019, at CSKA Arena in Moscow! 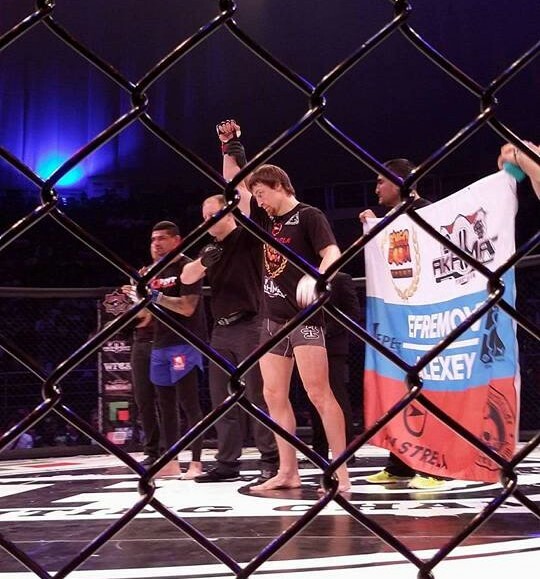 Eduard Vartanyan (19-4-0) from Team Strela has won 9 out of his 11 fights in ACA League, and this time his opponent is Joshua Aveles El Rey (27-11-2). We are really looking forward to enjoying this breathtaking fight! Don’t miss this featherweight match-up between former title challenger Faith McMah (6-3) and Helena Kolesnyk (Strela Promotion, 5-2) this February 15th at InvictaFC34! Welterweight fight at АСА 95! 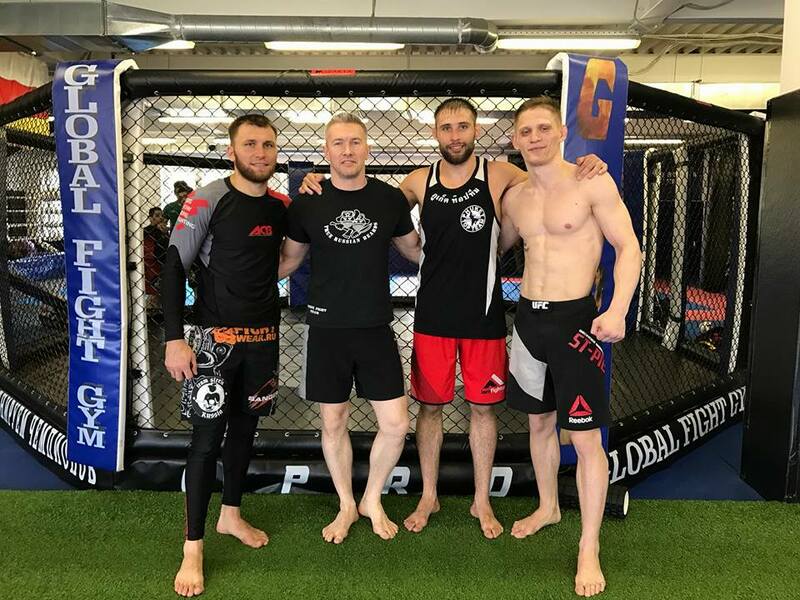 Sharaf Davlatmurodov from Strela Team makes his return to the Octagon on April 27th, 2019. 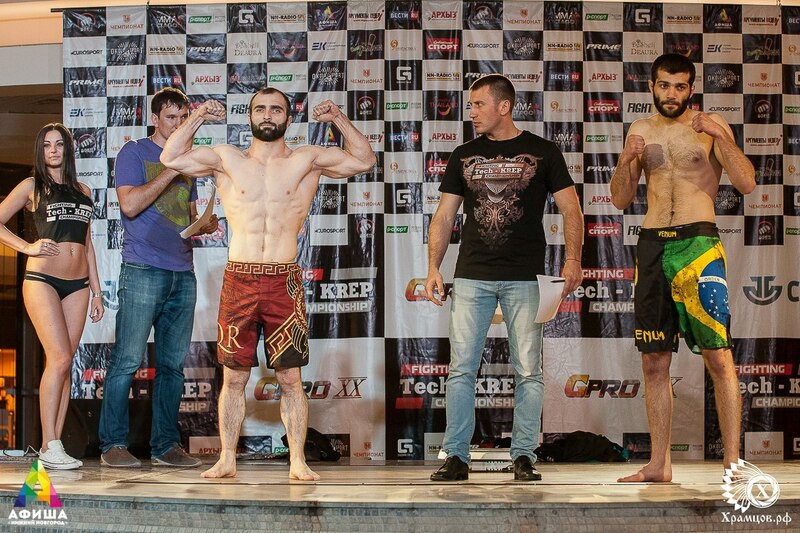 His opponent is MMA fighter from Akhmat Team Chersi Dudaev. 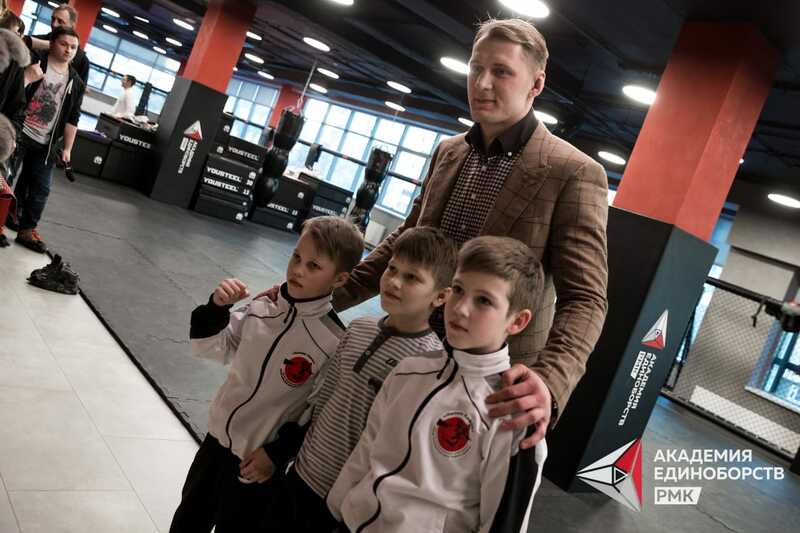 Alexander Volkov, UFC fighter and Strela Promotion Athlete, is visiting the Academy of Martial Arts RMK in Yekaterinburg, Russia. Alexander has been invited as an honorable guest and has given a number of interviews for local media there. 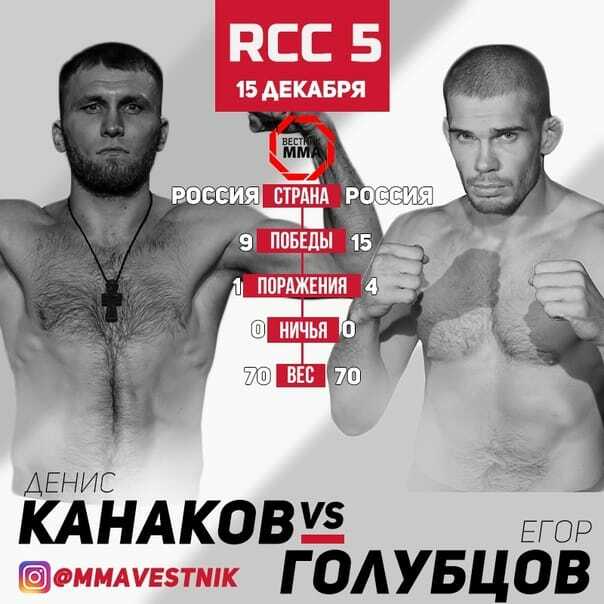 Denis Kanakov (9-1) from TEAM STRELA is going to have a fight at Russian Cagefighting Championship (RCC 5) on December 15th, 2018. 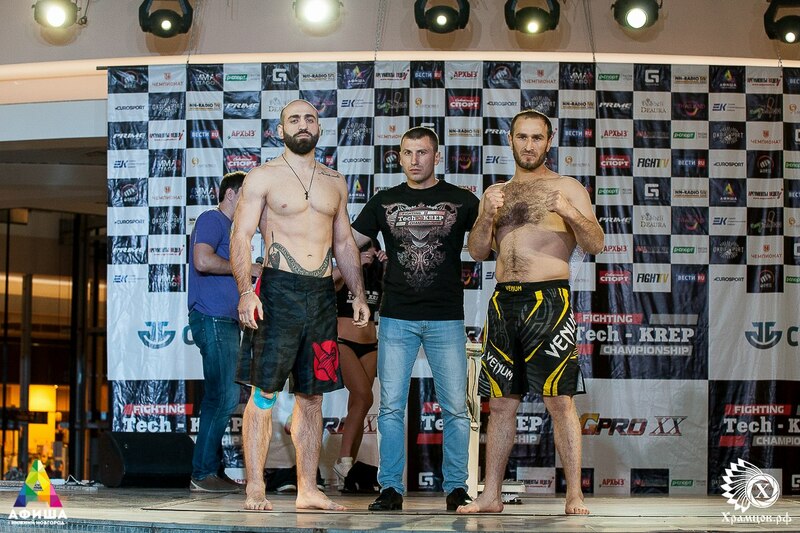 His opponent is MMA fighter Egor Golubtsov (17-6). 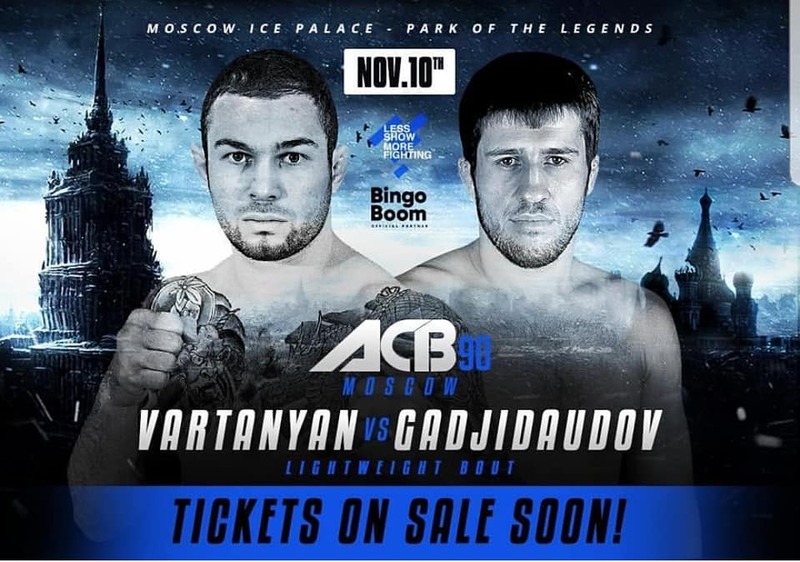 Eduard Vartanyan (18-4) vs. Ustarmagomed Gadzhidaudov (10-3). 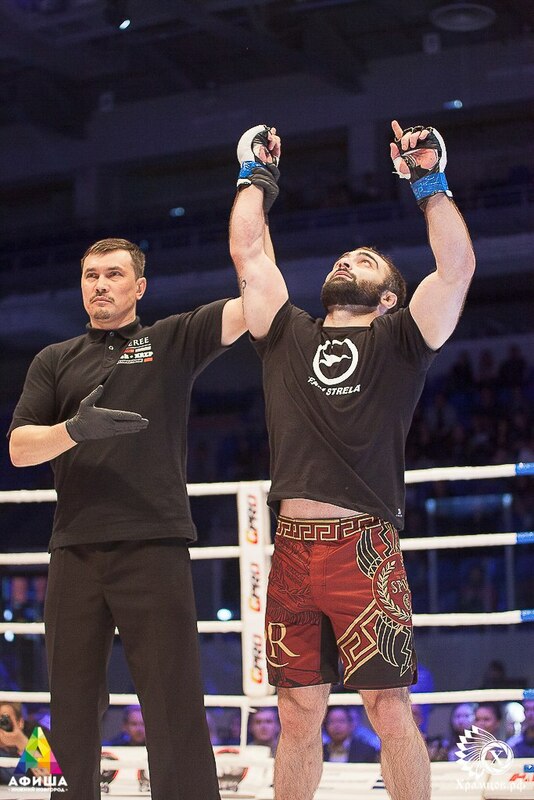 Vartanyan showed a brilliant fight and got victory by unanimous decision after 15 minutes. The city of Bobruisk in Belarus hosted the World Pankration Championship on November 1-4, 2018. The tournament gathered participants from 17 countries. Vladimir Daineko from Strela Team (MMA prof record 9-5) has won a title of Pankration World Champion in weight class +100 kg. Las Vegas – For the second fight in a row Derrick Lewis got physical with his opponent at weigh-ins. Alexander Volkov wouldn’t be intimidated though, and it almost turned in a full-fledged brawl. UFC President Dana White and on-stage security were able to separate the monstrous heavyweights before things escalated too far out of control, but now the tension going into the matchup has increased significantly. It just gets bigger! 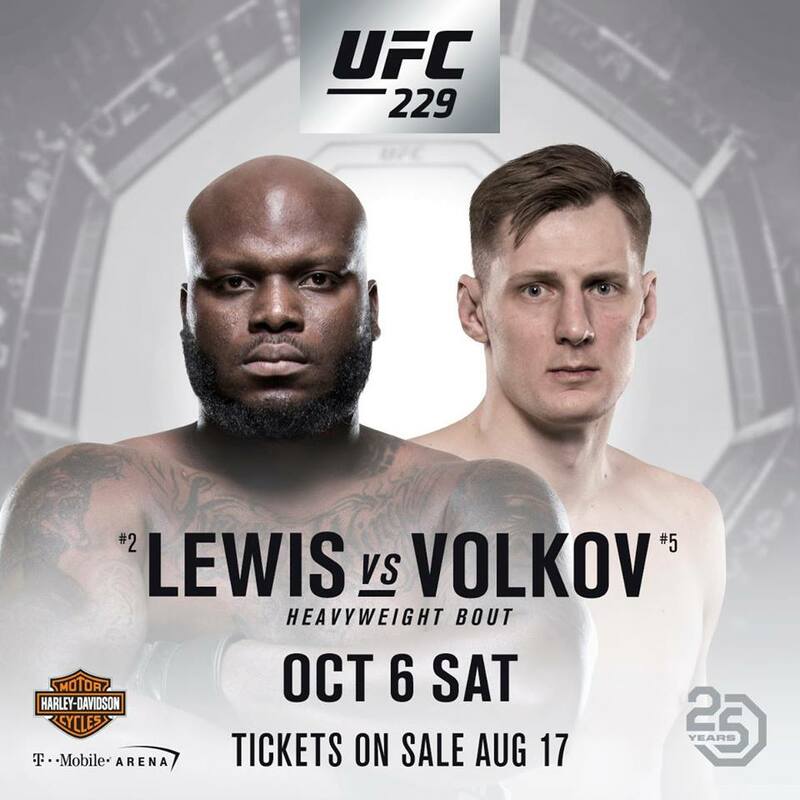 UFC229 adds heavyweights Alexander Volkov (30-6) vs. Derrick Lewis (20-5)! A heavyweight bout will take place on October 6, 2018, at T-Mobile Arena in Las Vegas. 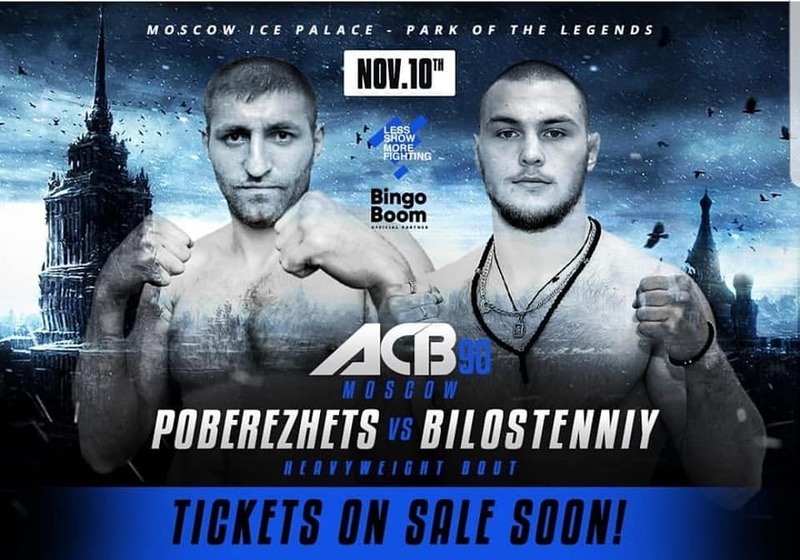 STRELA TEAM MMA fighters Eduard Vartanyan "Lionheart" (18-4), Sharaf Davlatmurodov "Wolfhound" (12-3-1) and Sergey Bilostenniy (5-1) are signed for ACB 90, which takes place on November 10, 2018, in Moscow (Russia). "...All my thoughts are about this fight. I hope to win and get closer to title fight at Invicta FC. That’s my biggest dream". 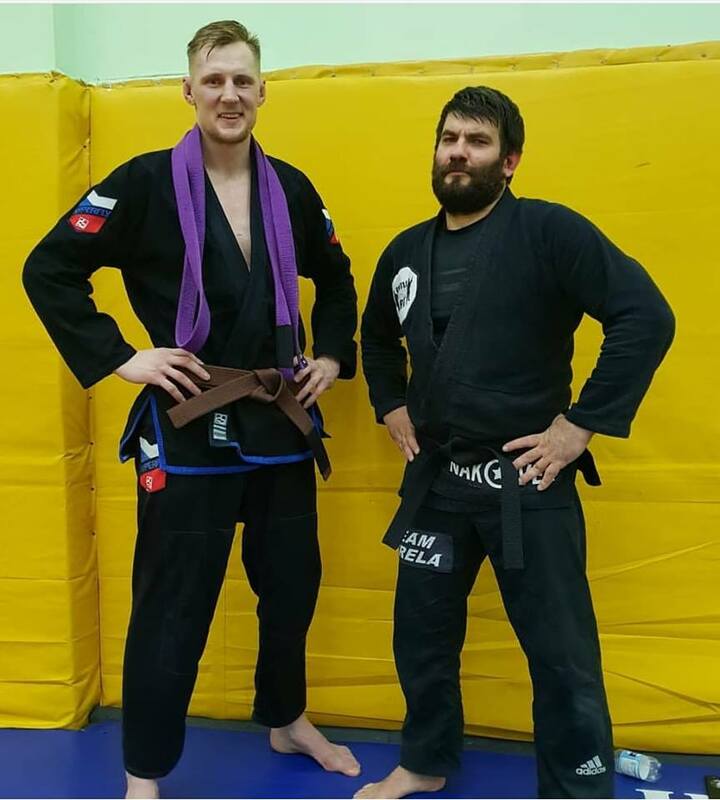 Congrats to Alexander Volkov with BJJ brown belt! Arsen Batyrov (record 3-1-0) from Strela Promotion will have a debut fight at Pancrase (Japan) on August 5, 2018. His opponent is a Japanese MMA fighter Akira Okada (record 13-5-3). Their weight category is 70,3 kg. Arsen Batyrov is a Master of Sports in Wrestling and candidate Master of Sports in Weightlifting. Sergey Khandozhko (Russia, Strela Team) will fight vs. Muller Da Silva Couto (Brazil) at the main event of Golden Team Championship tomorrow on May 26, 2018. Sergey is a Master of Sports in ARB (army hand-to-hand combat), Ashihara karate and Unifight. His list of achievements is impressive: the Champion of Russia in Ashihara karate, the Champion of Russia, Europe and the World in Unifight. Congrats to Mikhail Zayats with his WIN in co-main fight vs.Caio Maglahaes (Brazil) at M1 Challenge 91. 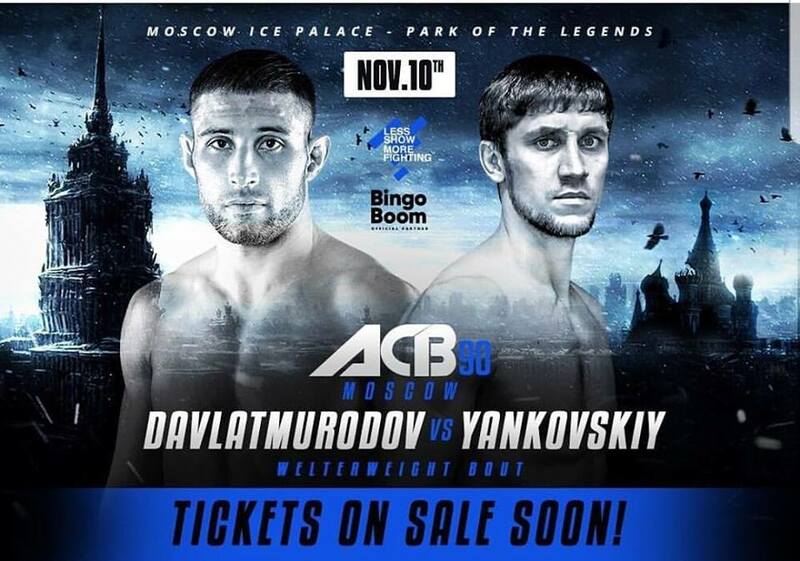 First bout at ACB 86: Denis Kanakov (Russia, Strela Team) vs. Abdul Azim Badakhshi (Afganistan). Congrats to Denis with his great WIN over KO (Punches) in R1. TEAM STRELA is preparing for upcoming events in May 2018. 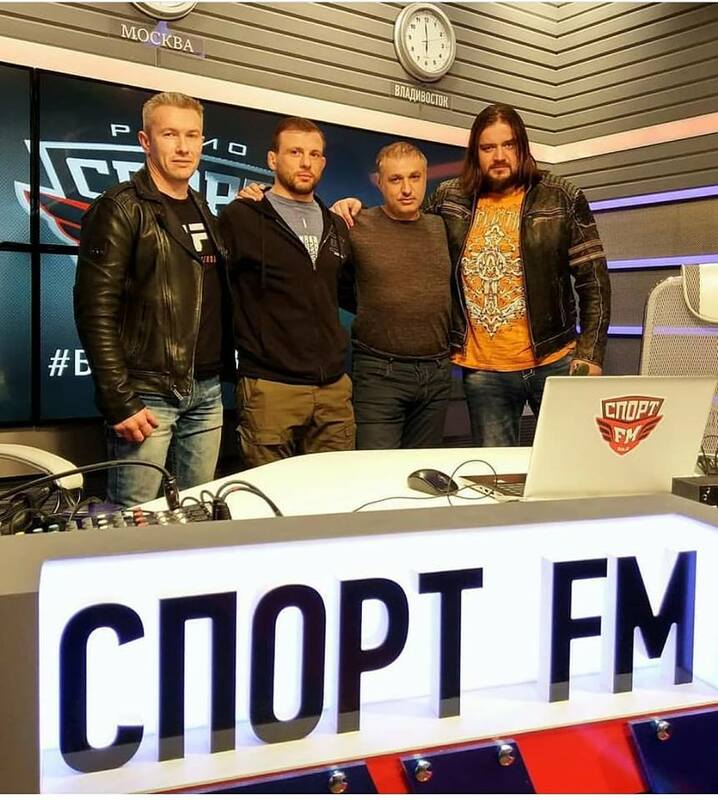 LIVE at Sport FM (Moscow, Russia): Taras Kiyashko (coach, Strela Team), Mikhail Zayats (Middleweight fighter, Strela Team), Igor Ryazancev (Sport FM), Ivan Bannikov (manager, Strela Promotion). Alexander Volkov explains to The Mac Life that he isn’t in London this weekend to just make up the numbers. 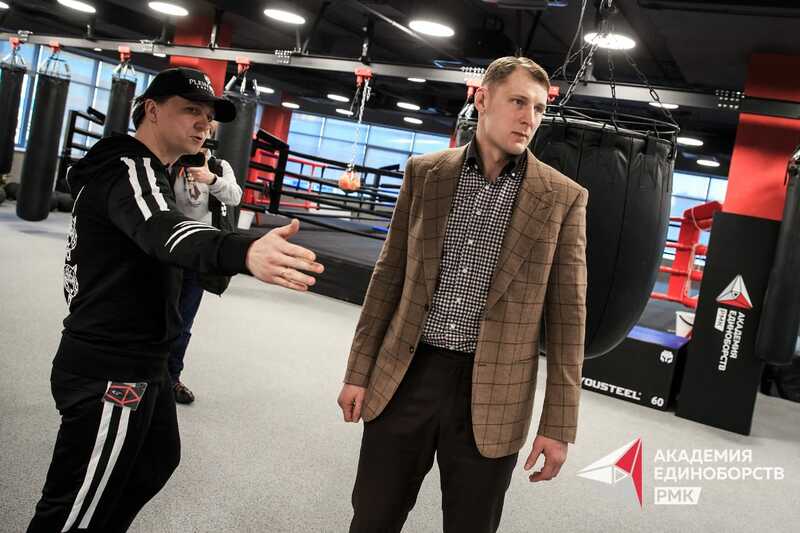 Russian heavyweight Alexander Volkov says that the constant role of being seen as underdog has never bothered him in his career, writes Denis Geyko. Volkov, who is set to face Brazilian veteran Fabricio Werdum in the main event of UFC Fight Night 127 in London this weekend, spoke exclusively to The Mac Life ahead of the bout. 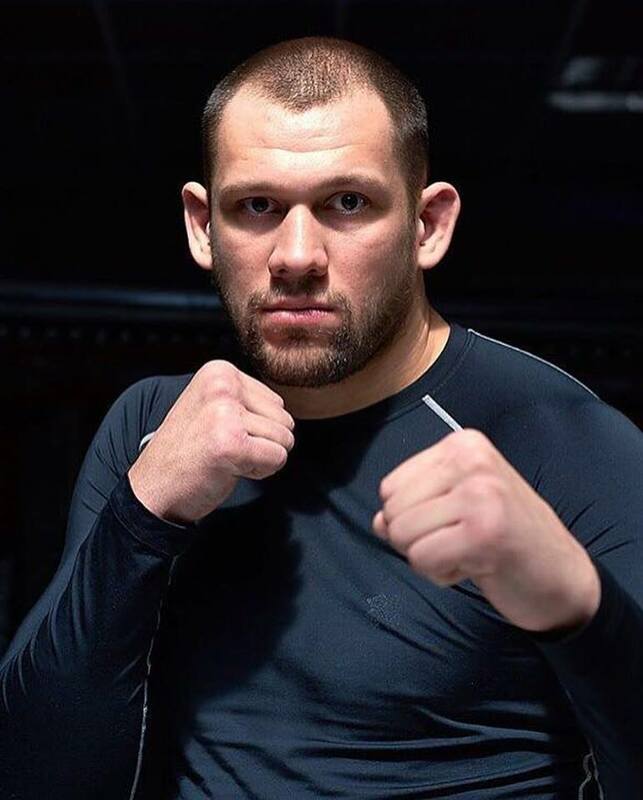 Speaking over the phone, the 29-year-old Moscow native, who landed in the England’s capital on Wednesday, told us about his preparation for the fight, being underdog and mutual respect with Werdum. The Mac Life: We know that during your preparation for your last fight with Stefan Struve you had a four-time K-1 World Champion, Semmy Schilt, who stands 6’11, as your sparring partner. 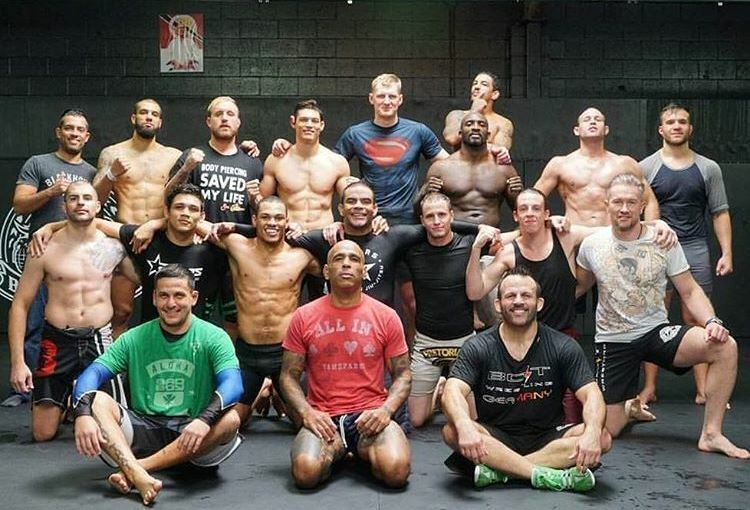 Did you have any special sparring partner for the fight with Werdum? Alexander Volkov: Not really. I was training with the guys from my own team (TEAM STRELA). The thing is, many of the guys in our team specialize in Jiu-Jitsu, so I’ve spent a lot of time with them working on this aspect. TML: Werdum is obviously one of the fighters, who many MMA fans and fighters looked up to growing up. Were you also watching his fights when making your first steps in MMA? And how does it feel to fight someone like that? AV: Recently I’ve been training with many notable fighters, and I kind of got used to training and fighting with the guys who I looked up to growing up. But of course it would be nice to add him to the list of my victories. Obviously, I have nothing but respect for Fabricio. A whole generation of the fans and fighters grew up watching his fights. And it’s hard to underestimate the role he has played in this sport. TML: Before your last fights you were making some sort of friendly provocations and callouts for your opponents on social media. And you were obviously pretty creative about it. But we haven’t seen any of those before the Werdum fight. Is it because of the respect you have for him? AV: I think we both have a great respect for each other, plus we have previously trained together. There is no single reason for a conflict between us. I just want to go there, do my thing, get it done. And hopefully we will stay friends after the fight. TML: Much like in your previous UFC fights you are considered an underdog in this bout. Does it ever bother you what people say about your chances before fights? AV: It doesn’t matter to me. Plus, those people who try to estimate the chances of the fighters before the bout, they miss one big thing – they weren’t in their training camps. They have never seen me training, they have never seen the other guys training. They are taking into consideration previous fights, and it’s a wrong thing to consider. Because people don’t know how well fighters were prepared for their previous bouts. Maybe one of the fighters wasn’t feeling well or something happened in his personal life. Being underdog doesn’t mean anything to me really. If I’d think about that I’d probably pull out from my previous fights, right? But that is ridiculous. I do believe in my abilities, and there is no other way in this game. Otherwise I see no reason to step in the cage. Congratulations to Mikhail Kolobegov for his brilliant victory! Well done! We are proud to announce that our team has a new talented heavyweight among our athletes. 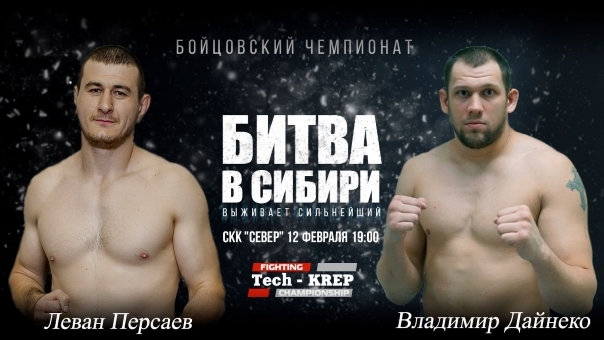 Strela Promotion MMA will deal with career promotion of Sergey Bilostenniy (5-1). 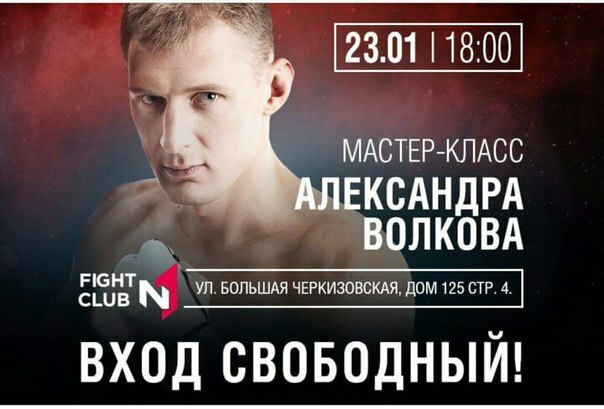 Currently, Sergey is signed with ACB league, he has also been invited to take part in Fight Nights event. The list of Sergey's achievements is really impressive: twice winner of the Russian Cup on army hand-to-hand combat, twice winner of the World Pankration Championship, the Bronze Medalist of the Thai Boxing World Championship, the World Champion and Champion of Russia in Kung Fu Sanda. In the main event of the evening, Abdulvakhabov and Vartanyan rematched for the Lightweight title. In their first fight Abdulvakhabov won decisively via a first round T/KO, however, this fight played out differently. 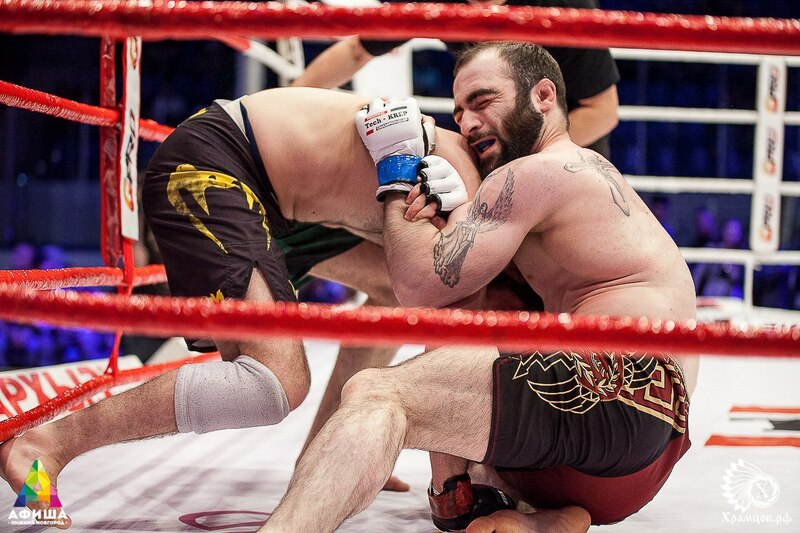 The majority of the first round was spent against the cage with Abdulvakhabov grinding Vartanyan. However, in the second round Vartanyan began effectively countering Abdulvakhabov who kept coming forward but was too focused on finding the knockout. The third and fourth rounds were spent in a similar fashion with Vartanyan playing the matador and Abdulvakhabov looking increasingly out of ideas. In the fifth round, Abdulvakhabov had more success but was still unable to find the knockout punch whilst Vartanyan kept working on the backfoot and landing the cleaner strikes. Despite, the commentators believing that Vartanyan has done enough for the decision Abdulvakhabov was awarded the split decision victory. 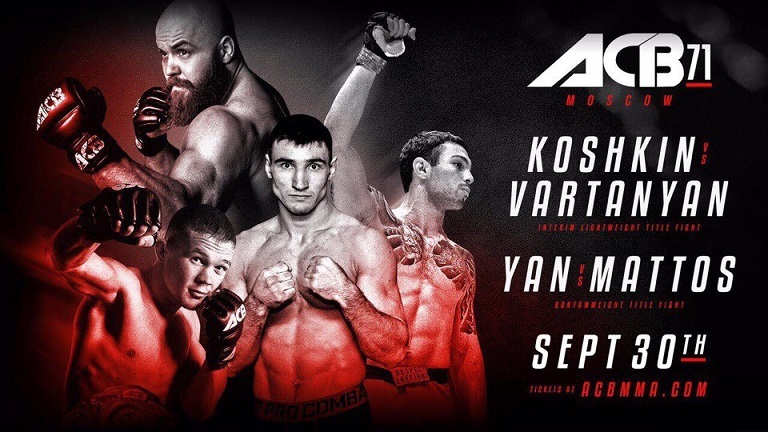 After the fight, ACB president Mairbek Khasiev said that he wants to see a rematch in Vartanyan’s homeland, Armenia. New opponent for Giga Kukhalashvili! Stephan Puetz got injured just a few days before the event, so another fighter from Germany will take his place. Sebastian Heil's professional record: 6 victories and 1 loss, 4 of 6 fights he won win knockout. 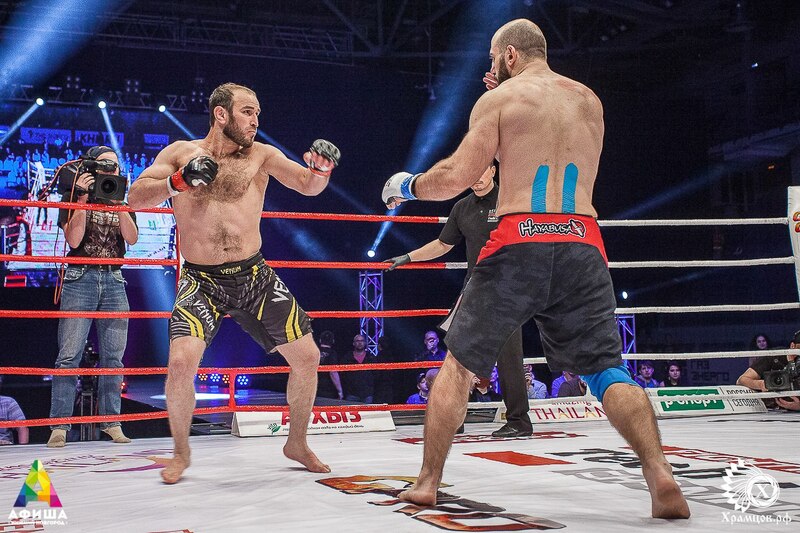 Giga Kukhalashvili is known as a brutal puncher and a fearless warrior. 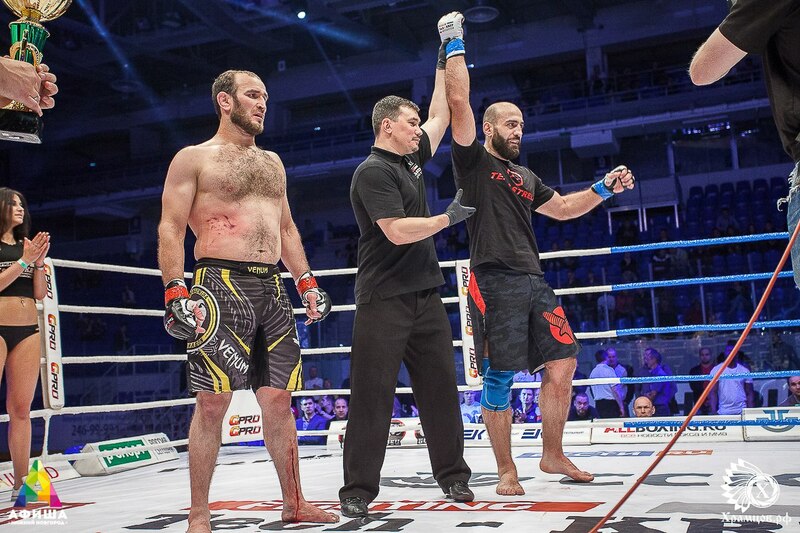 In his debut M-1 fight Kukhalashvili knocked out his opponent in just 59 seconds! Both fighters will try to end the fight quickly, so there are good chances to see an early KO by one of the strikers. 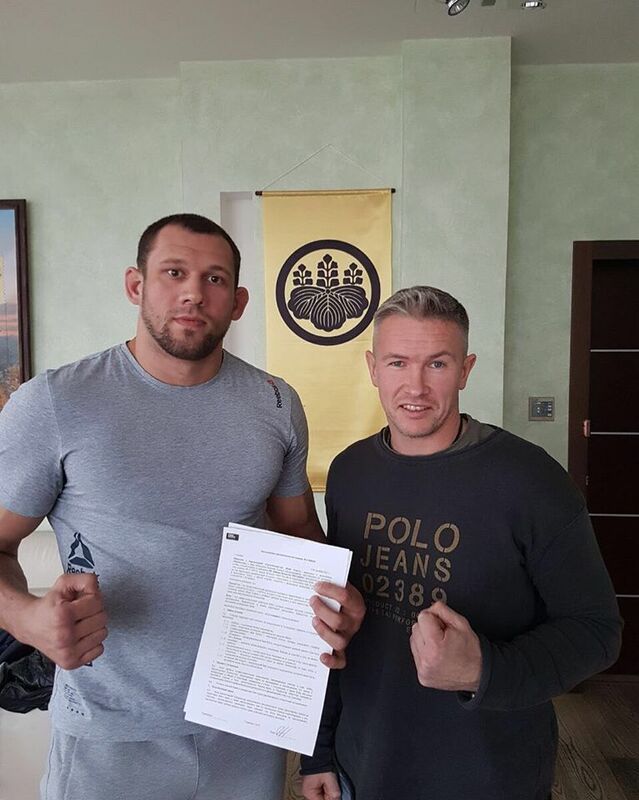 Vladimir Daineko signed a contract with FIGHT NIGHTS GLOBAL. 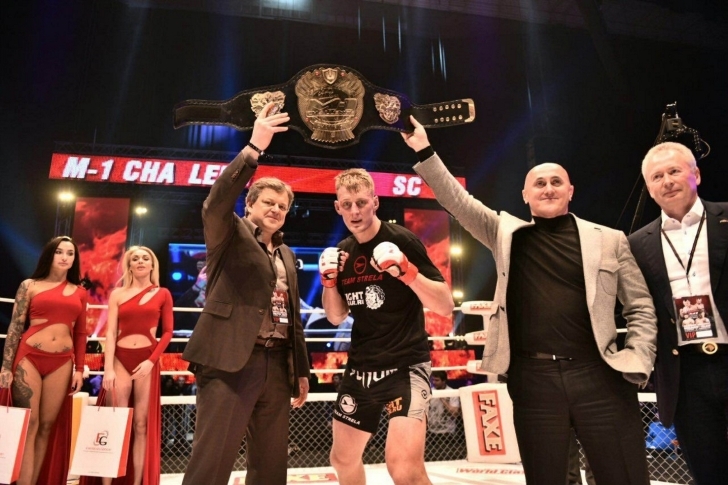 FIGHT NIGHTS GLOBAL Heavyweight rooster is now even more powerful - Fight Nights Global league has signed Vladimir Daineko, a 27-year-old fighter from Strela Team. 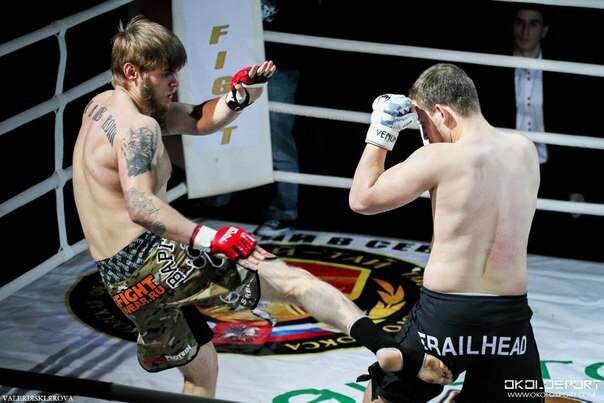 A Siberian athlete has managed to grasp MMA fans' attention with 12 pro fights (9-3-0). As an amateur Vladimir has won Russian MMA cup and World Pankration Championship. The contract with FIGHT NIGHTS GLOBAL is signed for two years. 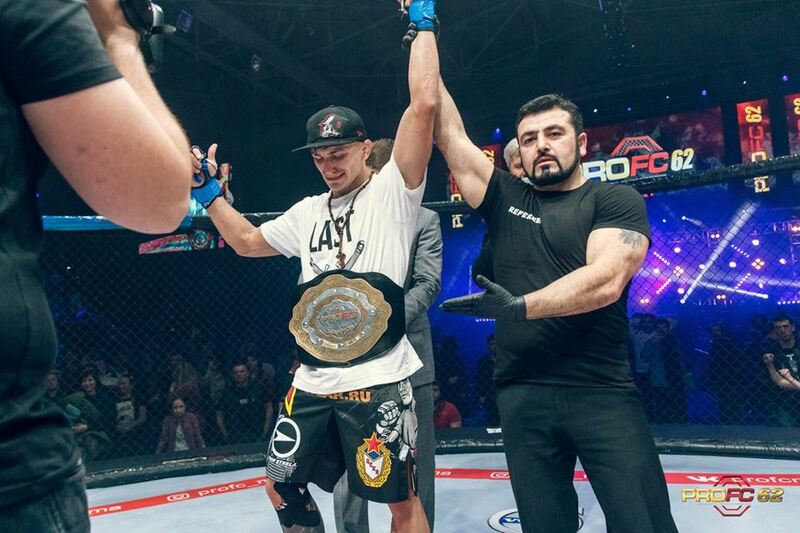 Best moments of 5 round battle at ACB 71: Eduard Vartanyan vs. Andrey Koshkin! On November 10, 2017, Stephan "T-800" Puetz (15-3) is going to fight against Giga Kukhalashvili (Strela Promotion, 8-3). Stephan Puetz is one of the most famous M-1 Global fighters. He is used to be an M-1 Lightweight Champion and now, after he lost his title, he is extremely motivated and ready for real comeback! His opponent Giga Kukhalashvili is known as a brutal puncher and a fearless warrior. In his debut M-1 fight Kukhalashvili knocked out his opponent in just 59 seconds! The fight against ex-champion is a great opportunity for him to make a step forward to a title fight. 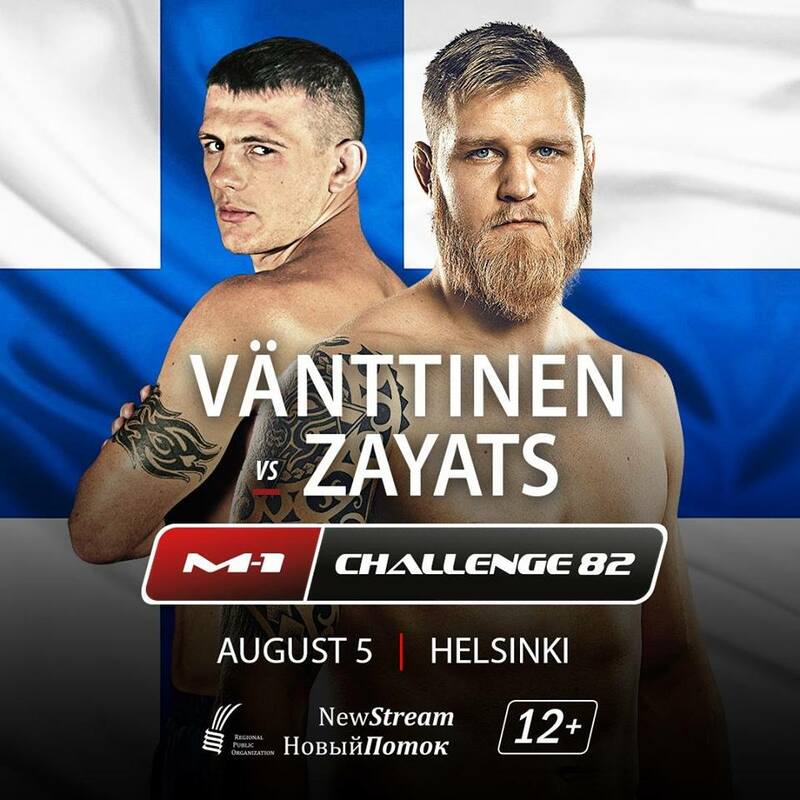 Both have huge armies of fans and it makes their battle at M-1 Challenge 85 even more exciting. We have our GIANT #UFCRotterdam main event! Alexander Volkov and Stefan Struve have checked in! UFC professional shooting crew visited Moscow from 9- 11th August. Supported by IMG (International Management Group IMG), Chris Taylor, Jeff Cummings and Eden Rosen took a flight from Los Angeles to exclusively interview Alexander "Drago" Volkov UFC fighter. 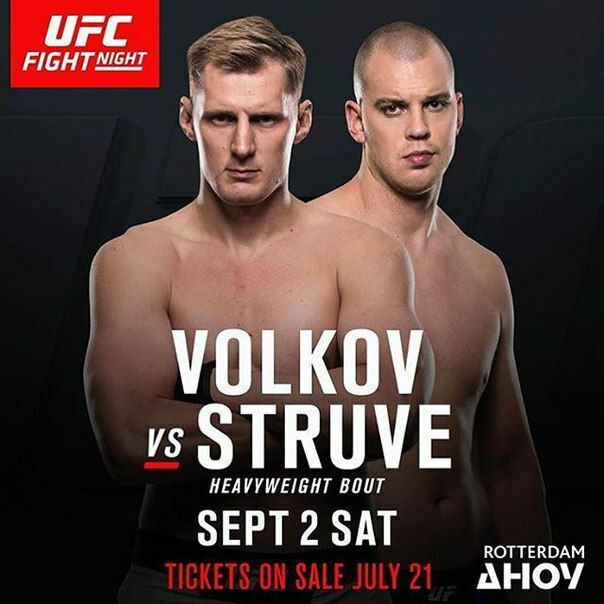 The upcoming performance UFC Fight Night 115 Volkov vs. Stefan Struve will take place in Rotterdam, September 2nd. Tournaments in Moscow traditionally please fans with powerful cards and stubborn confrontations in title fights. Each new tournament sets a new benchmark for the promotion itself and for the entire domestic martial arts industry. And this time ACB League is not going to slow down. Two title fights in the lightweight and bantamweight categories will please the audience. 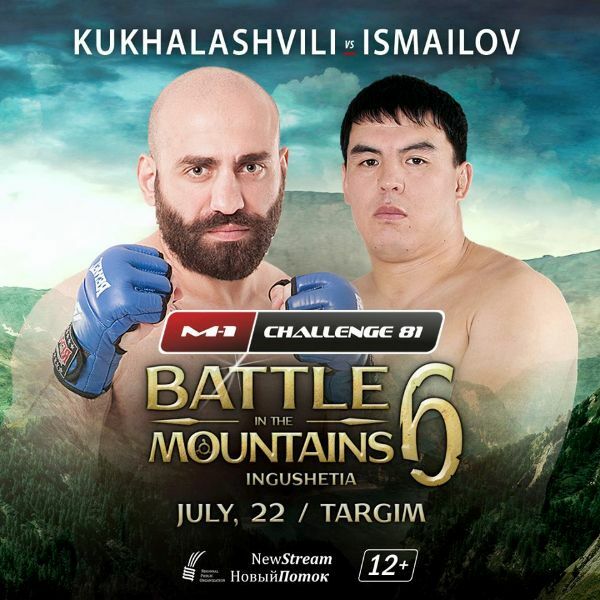 Since the champion is absent due to his injury, two main contenders for the title - Andrei Koshkin and Eduard Vartanyan will fight for the interim belt, and Petr Yan will defend his title for the first time against the Brazilian striker Matheus Mattos. 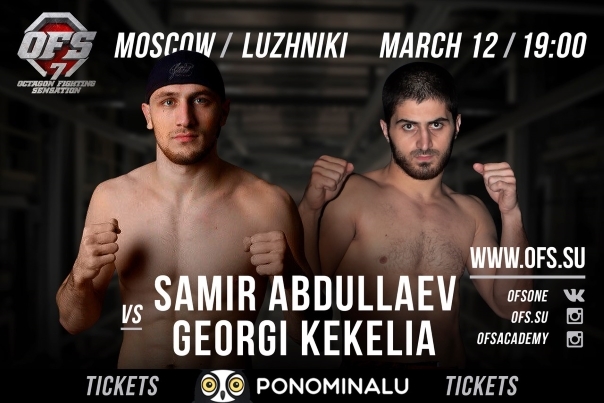 St. Petersburg’s striker Alexei Butorin, Akop Stepanyan, former UFC star Takeya Mizugaki and the contender fight Borisov-Kalamov are also in the card. Do not miss this powerful event on September 30, 2017! Special report on LIFE Channel with Strela Team MMA fighter Fatima Dudieva. Don't miss your chance to attend the return of UFC to Rotterdam on September 2nd at the Rotterdam Ahoy. 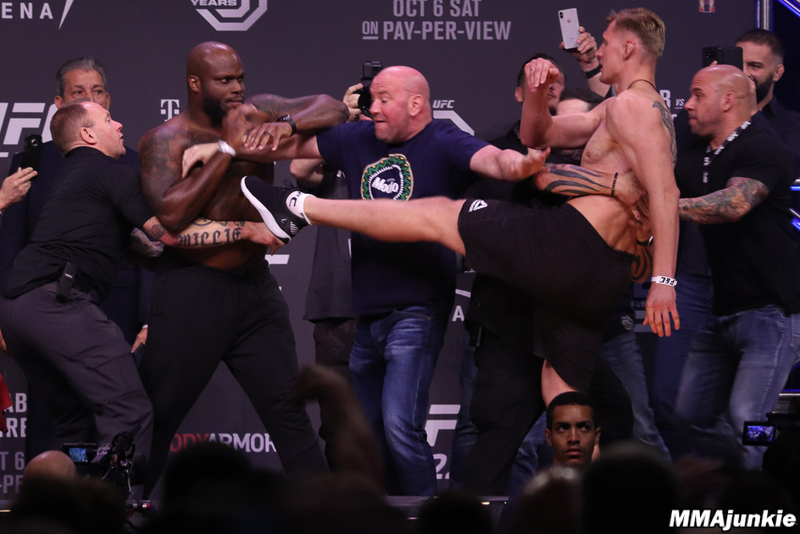 In the heavyweight main event, rising contender Alexander Volkov steps up to challenge the tallest athlete in UFC, the Netherlands' own Stefan Struve. 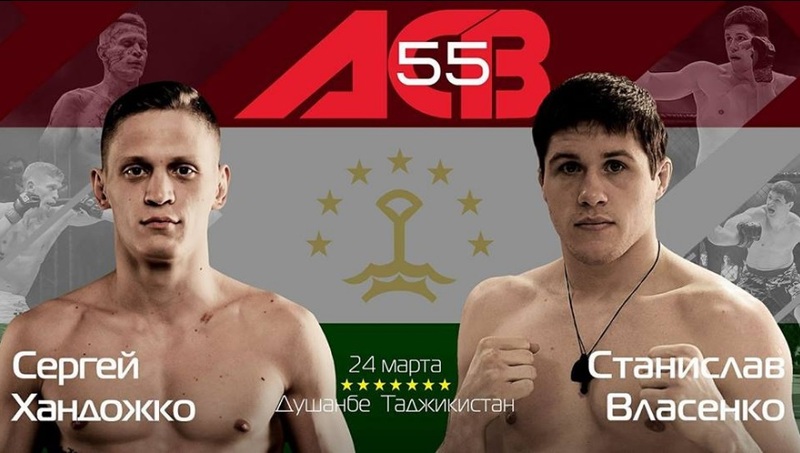 The fight between Nurbek Ismailov (3-0) Kyrgyzstan and Giga Kukhalashvili (7-3) from Strela Promotion is the nearest upcoming event M1Challenge81. It takes place on July 22 in Ingushetia, Russia. Helena Kolesnyk won’t be fighting for a title – or against a champion from another division – but she will get to remain on the Invicta FC 24 card. The all-female promotion announced Friday that Kolesnyk will meet Pam Sorenson in a 145-pound contest at the July 15 event. 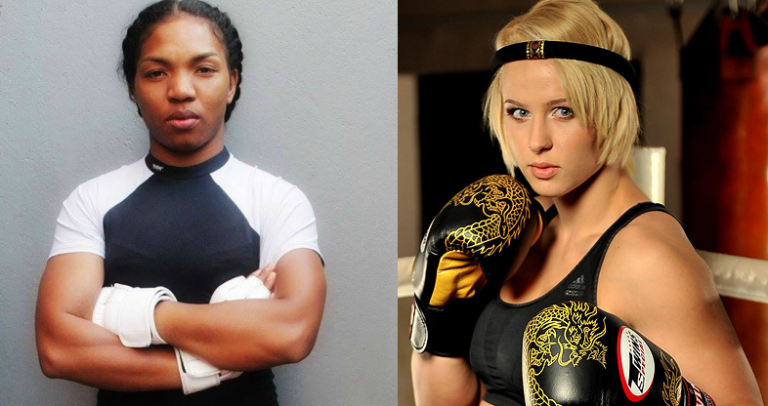 Additionally, a strawweight clash between Miranda Maverick and Gabby Romero was added to the card. Invicta FC takes place at the Scottish Rite Temple in Kansas City, Mo., and is headlined by a flyweight tilt between Milana Dudieva and Mara Romero Borella. The eight-bout card will stream in its entirety on UFC Fight Pass beginning at 8 p.m. ET/5 p.m. PT. Kolesnyk was initially slated to challenge Megan Anderson for the featherweight crown in the Invicta FC 24 main event, but Anderson was signed by the UFC to face Cristiane Justino for the Las Vegas-based promotion’s vacant 145-pound strap. Kolesnyk was then booked against reigning bantamweight queen Tonya Evinger in the new headliner. However, after Anderson was removed from the UFC 214 bill, Evinger was tabbed to face “Cyborg,” once again leaving Kolesyk without an opponent. A 27-year-old native of the Ukraine, Kolesnyk is unbeaten in six professional appearances, with all of her victories coming inside the distance. Sorenson, meanwhile, is 5-2 overall and is coming off a split-decision loss to Ediane Gomes at Invicta FC 23. 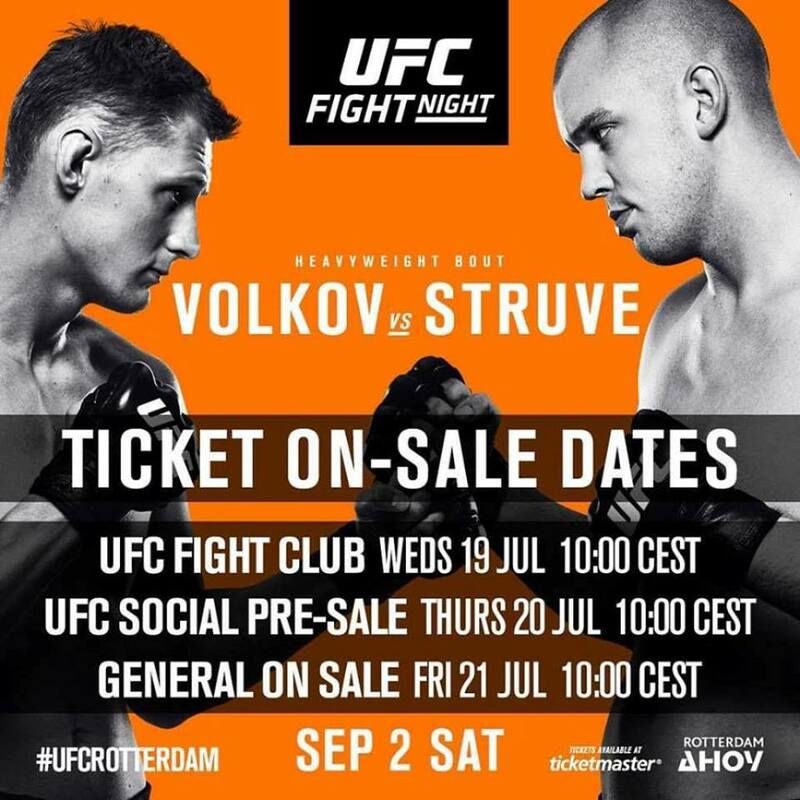 Russian fighter from Strela Team Alexander Volkov (28-6 MMA, 2-0 UFC) and Dutchman Stefan Struve (28-8 MMA, 12-6 UFC) will serve as the five-round headliner for UFC Fight Night in Rotterdam. The event will be streamed live on UFC Fight Pass on Saturday, September 2nd at Ahoy Rotterdam. STOCKHOLM – Dutch heavyweight Stefan Struve and fellow big man Alexander Volkov will meet in a five-round affair in the Netherlands. Volkov is currently ranked No. 15 in the latest USA TODAY Sports/MMAjunkie MMA heavyweight rankings, while Struve checks in as an honorable mention. 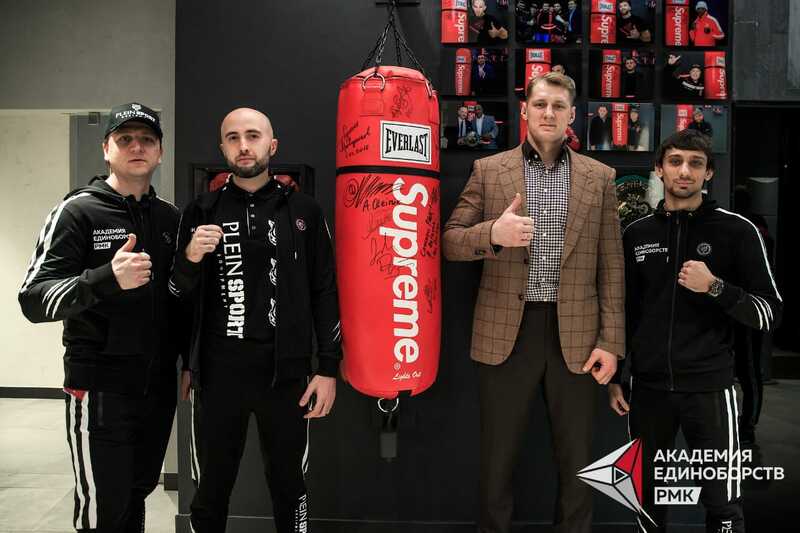 The two fighters openly campaigned for the matchup, with the 7-foot Struve taking to social media to respectfully express his interest in facing the 6-foot-7 Volkov, who willingly obliged. 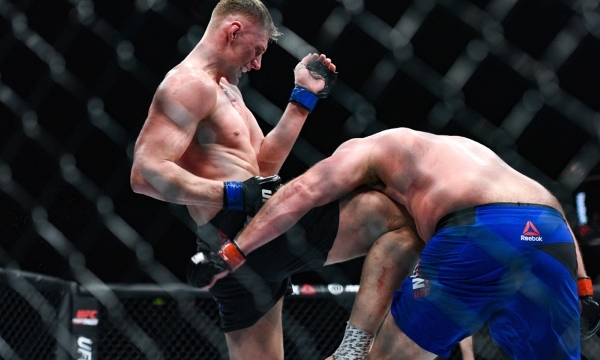 Struve carries a two-fight winning streak into the contest after downing Daniel Omielanczuk this past October in England, as well as scoring a 16-second knockout win over Antonio Silva at UFC Fight Night 87 in May 2016, at the UFC’s debut event in the Netherlands. 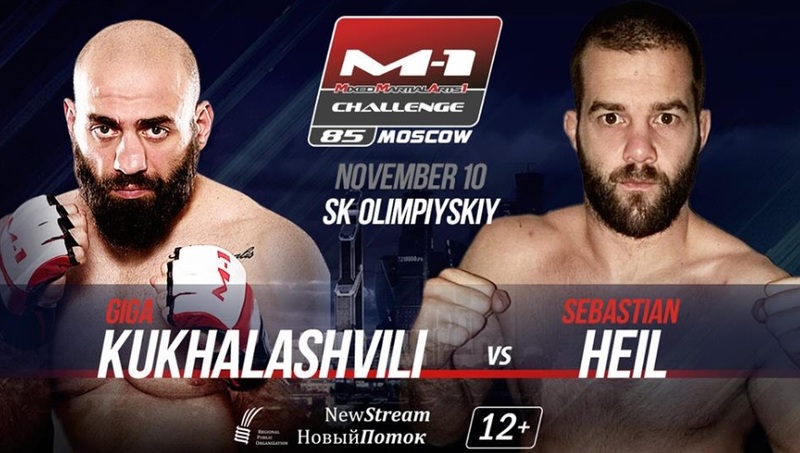 Meanwhile, former Bellator heavyweight champ Volkov brings a four-fight winning streak to the matchup – a run that includes UFC victories over Roy Nelson and Timothy Johnson, as well as M-1 Challenge victories over Attila Vegh and Denis Smoldarev. For more on UFC Fight Night in Rotterdam, check out the UFC Rumors section of the site. Roy Nelson returned to action Saturday at UFC Kansas City, but didn’t find the result he was looking for, dropping a decision to Alexander Volkov. UFC Kansas City went down Saturday night from Missouri and in the featured fight of the preliminary card, Roy Nelson returned to action following a suspension for push kicking ref “Big” John McCarthy. Opposite him was Alexander Volkov, a former Bellator heavyweight champ. 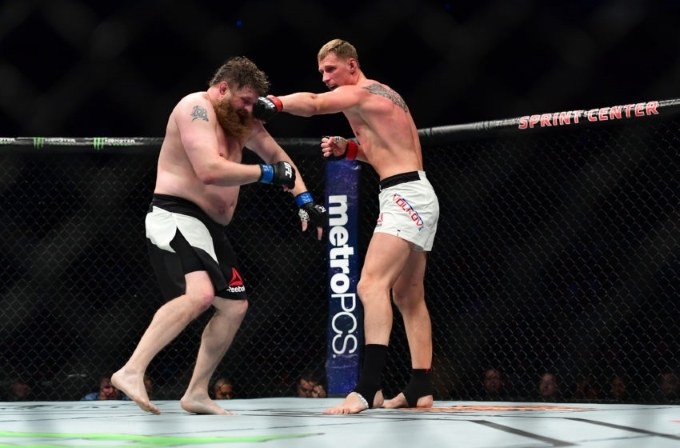 After utilizing his rarely seen ground game in the first round, a standup late in the frame forced Big Country to stand with the much taller Volkov, but more than likely, Nelson stole the first round through positional dominance. In the second, however, Volkov utilized knees to the belly and stayed on his feet, evening the score. Running into the third, cardio was the story of the fight, as Volkov used his height and reach advantage to keep Nelson at bay. Nelson stalked his opponent, constantly moving forward, but was kept on the outside, unable to do any damage. Not unlike many a Big Country bout, the action still went the distance, and at the end of three rounds, the fight went to the judges’ scorecards. All three judges scored the fight in favor of Volkov, awarding the Russian fighter a 30-27 on every single card. With the win, Volkov improved to 2-0 in the UFC, and 28-6 overall. At 40, it appears Roy Nelson will move into a gatekeeper role in the UFC, while the 28-year-old Alexander Volkov will look towards the top ten of the division. 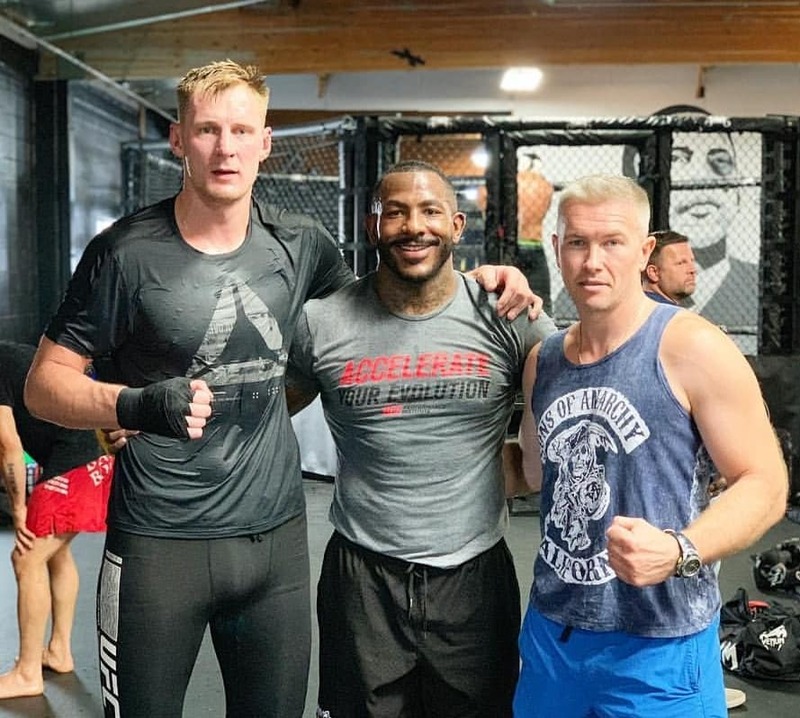 Former Bellator heavyweight champion Alexander Volkov came to the UFC this past fall and got the hard part out of the way: He won his promotional debut. At UFC Fight Night 99 in Belfast, Northern Ireland, Volkov took a split decision from Timothy Johnson in a tough fight. But the bout was made harder, he said, because of a mistake he made in the fight that caused him to not only need to beat Johnson, but another opponent after being backed into a corner: himself. “The first fight in the UFC was very emotional for me – I had a lot of things going through my mind,” Volkov told MMAjunkie. “For me, it was a fight against myself. In the first round, I hurt him and I went for the kill, and I did a lot of things I’ve never done before. I forgot about my defense and I got caught. I was in the worst scenario, personally, for me – I was knocked down and there was a good wrestler on me. 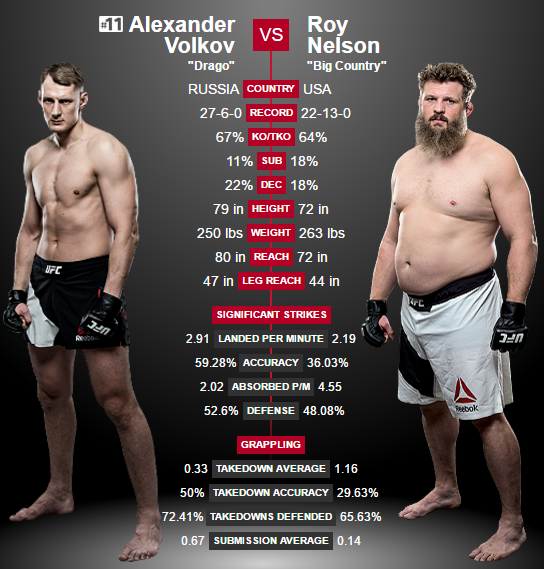 Today, Volkov (27-6 MMA, 1-0 UFC) has arguably an even bigger task at hand than the one he had against Johnson in November, and that’s his UFC on FOX 24 opponent, Roy Nelson (22-13 MMA, 9-9 UFC). UFC on FOX 24 takes place today at Sprint Center in Kansas City, Mo. 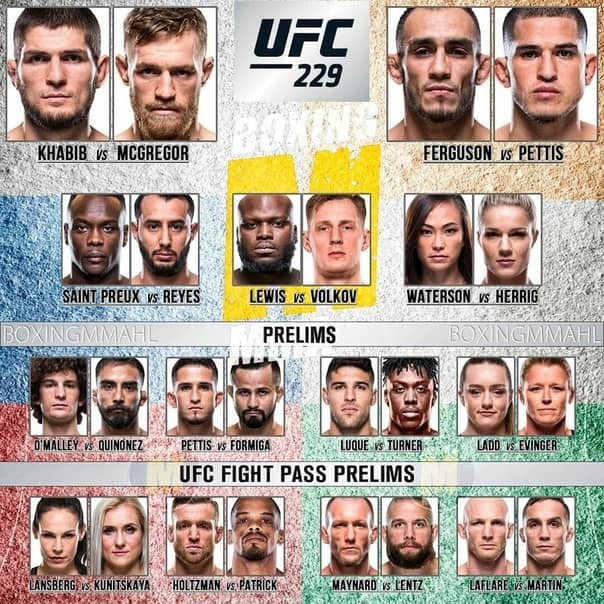 The main card airs on FOX following prelims on FOX and UFC Fight Pass. Volkov’s fight with Nelson is the featured prelim on FOX. If Friday’s weigh-ins were any indication, Volkov may also be fighting the crowd noise when he heads to the cage. There is perhaps no bigger everyman veteran fan favorite in the heavyweight division than Nelson. Volkov? He’s a 6-foot-7 Russian fighting in the heart of middle America against an American. The current political climate certainly may mean the Kansas City fans could turn things into U.S. vs. Russia in an instant. But that won’t bother Volkov, he said – and he hopes things are cordial with he and Nelson, especially since he also admits to liking him having watched his fights through the years. As for how the fight will play out, Volkov, who has won three straight after leaving Bellator, believes he has more ways to beat Nelson than Nelson has to beat him. Nelson has won two of his past three, but the lone loss was a split-decision setback to Derrick Lewis that he believes he won. “I’m training every day and I see I’m devloping,” Volkov said. “I’m trying to develop as a fighter. I had a big winning streak in my previous days, and I hope to have a big streak again. I hope 2017 will be a year of many victories. For more on UFC on FOX 24, check out the UFC Rumors section of the site. After it was revealed that UFC veteran Roy ‘Big Country’ Nelson will face Russian newcomer Alexander Volkov in Kansas City on April 15, RT Sport spoke to the latter about his thoughts and plans for the upcoming fight. 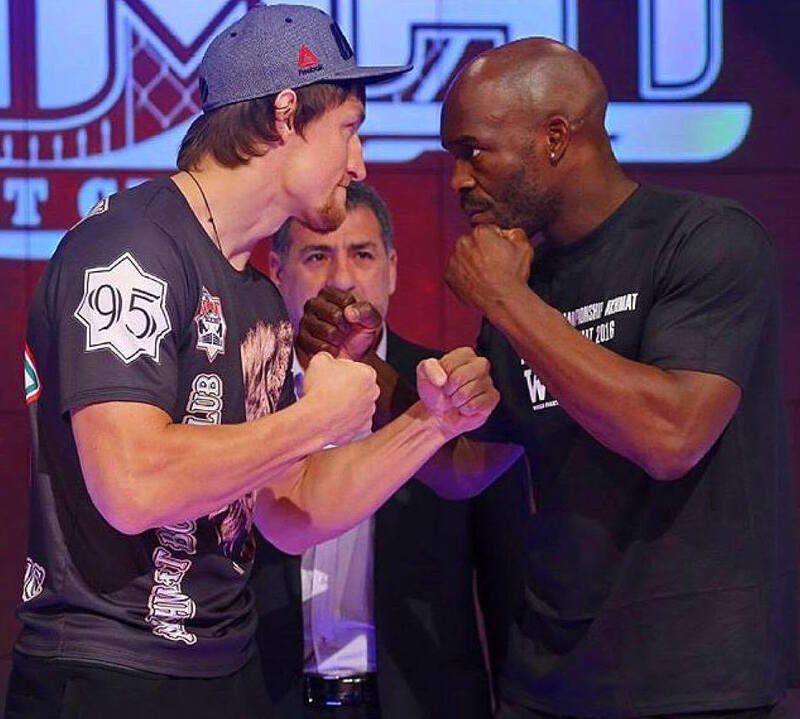 Despite being a newcomer to the UFC – with just one victory over Timothy Johnson last November – the 6ft 7in Russian, who began his career in mixed martial arts eight years ago, has racked up 33 (27-6) professional fights, including seven bouts and a championship belt in Bellator. He lost the belt to a fellow Russian, the undefeated Vitaly Minakov (19-0), in November 2013, suffering the only knockout of his career in the process. Now, 28-year-old Volkov – nicknamed 'Drago' after his resemblance to the Rocky character – says he is ready to test himself against the best fighters in the UFC heavyweight division. RT: You are fighting Roy Nelson in April, what do you expect from that fight? Alexander Volkov: He’s a good, experienced opponent. I’d say it’s the biggest challenge of my career so far. He’s a veteran with a big name and one of the fighters I looked up to growing up, he’s a solid opponent. However, I feel that I’m ready to face serious opponents and win, that’s why I’m preparing to the best of my ability. Nelson has a fan base in Russia, a lot of my friends follow him and I always liked him too. MMA fans like him and it’s because of him that our fight will attract attention, but if the fans want to root for me, I certainly wouldn’t mind (laughs). RT: When did find out you would fight him? Alexander Volkov: I actually signed the contract a couple of months ago, so I already knew the name of my opponent and have been preparing for him since then. It wasn’t really a surprise for me when it was announced officially. How is training going for the bout? Alexander Volkov: The first part of my camp took place in Thailand. Now I’m training here in Moscow. The next and final stage will be acclimatizing in America. What do you see as your key to victory in that fight? 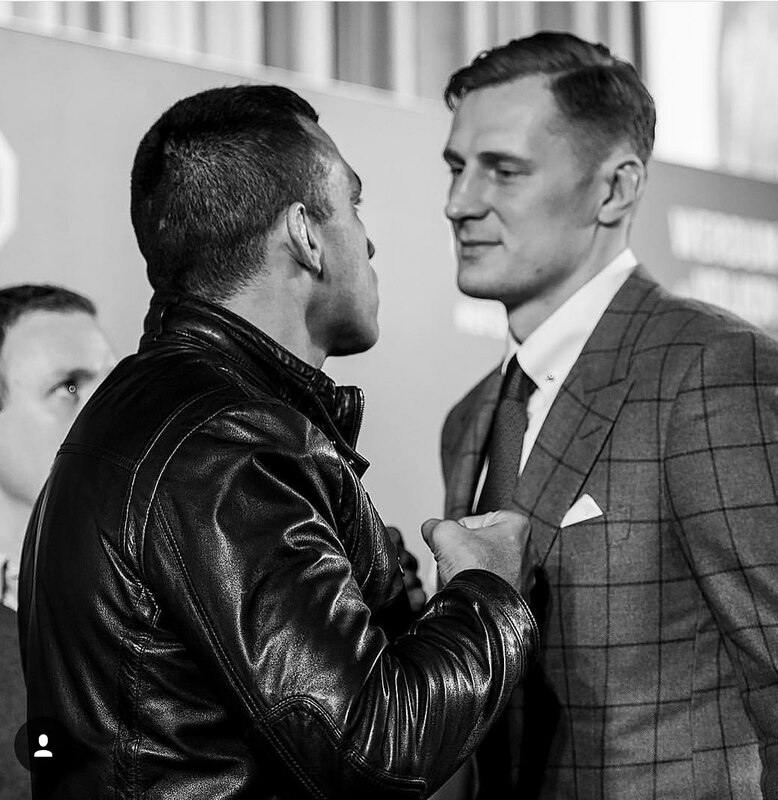 Alexander Volkov: One of my keys could be my height and I’ll use it to my advantage when striking. Striking is my style after all, and I’ll look for a stand-up fight. But I’ll be ready for everything, as I always am. How would you rate your chances in the UFC heavyweight division? Alexander Volkov: There are some really good fighters in there, they’re all at the top of the rankings, while there’s also some new blood looking to make some noise. I’d single out Francis Ngannou and Derrick Lewis. But they’ve had more fights than me, this will be only my second fight in the UFC. They are rivaling the top fighters, I think I’ll do that too (laughs). Just before the Arlovski-Ngannou fight, you said you might fight the winner next – why did that not materialize? 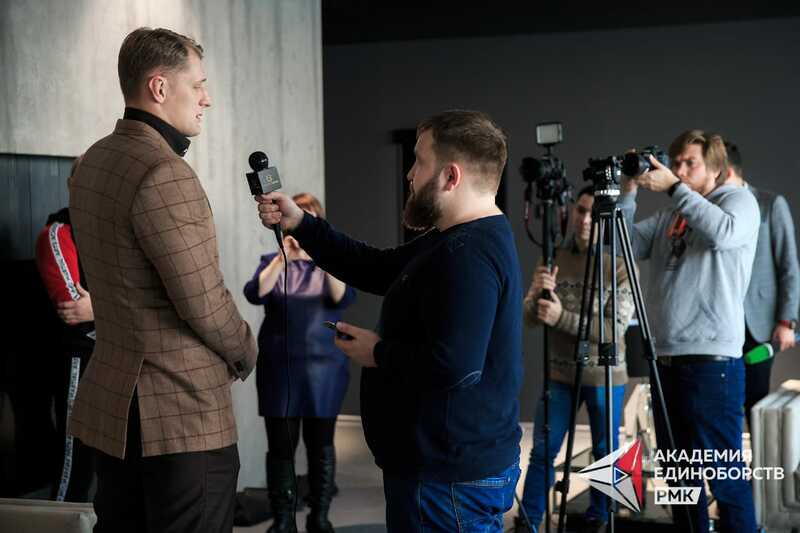 Alexander Volkov: There were talks with the UFC about a possible fight with the winner of Arlovski-Ngannou but after the fight, Ngannou decided to take a break and now he has different ambitions. He wants to fight for the title. So with me being ranked 11 it’s hard to talk about that fight. But I think we’ll fight later anyway. We are both strikers and despite being newcomers we’re going up in the rankings. In a year or two we’ll meet. Alexander Volkov: I started my career in karate. Then I tried MMA, I liked it and went pro. But yes, I have a karate style. When did people start calling you Drago? Alexander Volkov: I got that nickname when I went to United States for the first time. I had to pick one so the American audience would remember by that name. I was offered a couple of options. I can’t say that I was enthusiastic about picking one, but Drago seemed right, so I kept it. Our training sessions gather speed! 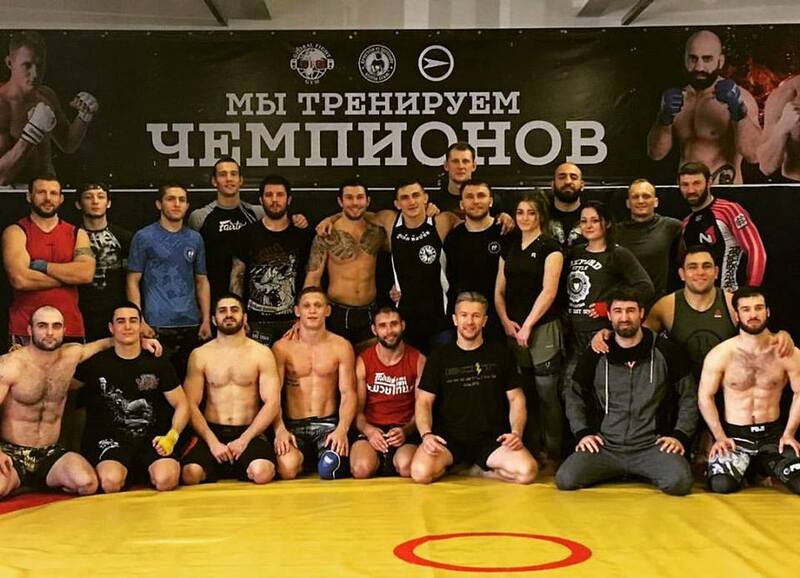 TEAM STRELA fighters and our friends are preparing for UFC, ACB, ProFc and other events in March and April 2017. The sky is the limit! Sherdog. Opinion: "there’s actually some light at the end of the tunnel in the rapidly-aging division, as Derrick ''The Black Beast'' Lewis, Francis N'Gannou, and former Bellator MMA champion Alex Volkov"
What the hell did I watch Saturday? I’m honestly not sure if, even by Ultimate Fighting Championship heavyweight standards, Derrick Lewis is actually good. He has skills, and he may just be incredibly worn out from his schedule in the last two years, but I just watched him beat someone in Travis Browne who is, in many ways, the better fighter, and I’m not even sure how he did it. Browne looked the best he has in years, quickly hurting Lewis with body kicks before...not really doing anything? He was right not to rush in against Lewis, but he just kind of...stopped fighting with any kind of plan, which was always the story with him. Even with Lewis constantly clutching his abdomen in a fashion that resembled a child who ate too much ice cream more than a hurt prize fighter, Browne didn’t look to finish with kicks the way he did against Alistair Overeem. Wait, that guy who lost to Lewis beat Overeem and Josh Barnett? And now this happened, a year after he basically cheated to beat Matt Mitrione, when he started to lose the fight? And Lewis is now ranked ahead of an expert striker like Mark Hunt because he actually has the higher-ranked signature win? What the hell is going on? Heavyweight is, confusingly, simultaneously the best and worst that it’s been in a long time. In the positive column, there’s a decent amount of parity, to the point that Junior dos Santos getting a title shot with no win streak hasn’t elicited the kind of complaints that his and Cain Velasquez’s previous title shots under similar circumstances did. Plus, that his shot at Stipe Miocic is a rematch of possibly the best headliner in the entire run of “UFC on Fox” cards certainly helps. The champion, Miocic, is incredibly likable and marketable, plus he has spectacular fights, and might have the stylistic attributes to be the first UFC heavyweight champion with three consecutive successful title defenses. Ben Rothwell, while often sidelined by injuries, has put things together to the point that he’s in the mix at the top of the division, and he’s coming off the most impressive submission in all of MMA in 2016. Plus, finally, there’s actually some light at the end of the tunnel in the rapidly-aging division, as Lewis, Francis Ngannou, and former Bellator MMA champion Alexander Volkov all have legitimate spots in the rankings. On the other hand, this is a division where Aleksei Oleinik and Timothy Johnson, who are both very much career journeymen, are ranked, and they absolutely deserve it. Nothing against them: they’re skilled fighters, often fun to watch, and seem like swell guys to hang out with. But they’re also the types of fighters who would not be ranked in just about any other division. Oleinik just won a fight by submission while he was mounted, for crying out loud. Even if you set aside the depth issues, there’s a more immediate problem: The UFC brass, both former and current, clearly has no idea how to leverage the most marketable fighters in the division. This is a problem in every division, but it’s especially pronounced at heavyweight. Let’s look at the champion, Miocic. He has exciting fights, with his last tepid performance being against Gabriel Gonzaga over three years ago. When Miocic is not in camp for a fight, he’s still working as a firefighter as often as possible even though he no longer needs to. On Twitter, he’s a quick-witted, underrated follow, although not nearly as funny as Lewis. And when he won the title, it was a gigantic event in his hometown of Cleveland. The UFC didn’t drum up any additional publicity for Miocic’s victory celebration in Cleveland. There’s been no effort to promote his personality, or, outside of token shots on “Countdown” shows, the fact that he goes out of his way to save people’s lives even though he’s a full time fighter now. And in spite of being in at least two of the best heavyweight fights in UFC history with Dos Santos and Overeem, those fights haven’t been pushed as such, which is puzzling when the former came a year after the incumbent “best heavyweight fight” was tarnished by a doping test failure. If you were going to use the mythical lab to build a marketable heavyweight, he’d look something like Miocic. That said, this is heavyweight. Maybe they’re just worried that if they invest too much time in Miocic, he’ll get knocked out before long by that guy who won the other night. You know, the one who used the post-fight interview to talk about Ronda Rousey, domestic violence allegations against his opponent and his need to poop. 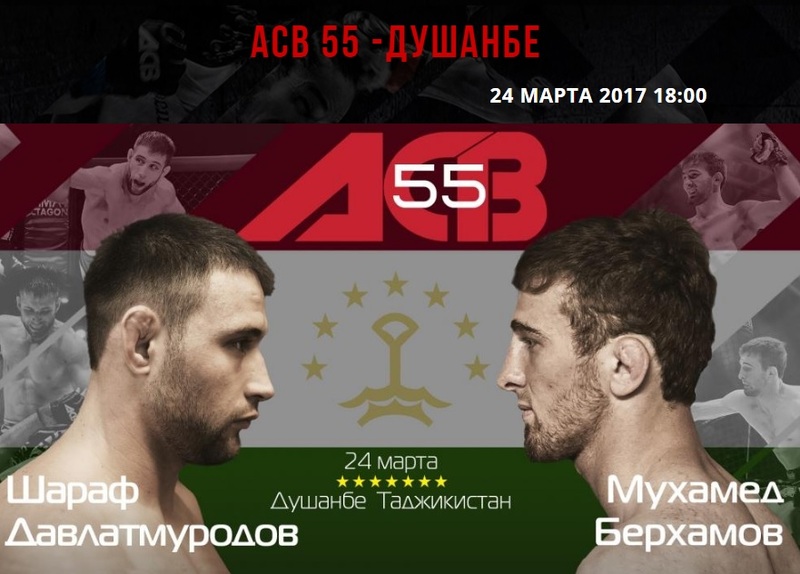 ACB 55 on March 24! 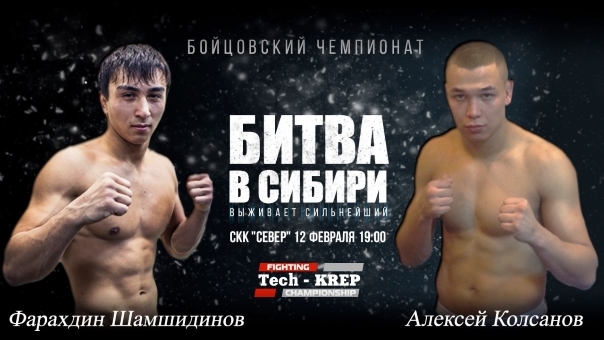 Russian MMA club Strela Promotion and American Black Нouse MMA launch a joint promotion campaign. Strela Promotion is going to represent Black Нouse fighters in Russian mixed martial arts organizations and leagues and Black House is going to help Strela to promote fighters in American fighting promotion companies. Both clubs are also planning to arrange different joint activities, regular training and seasonal camps in USA and Russia. The training for international events promises to be more efficient now due to professional opportunities for sportsmen and additional benefits such as availability of camps to stay prior the tournaments or better conditions to carry out acclimatization. “By the end of the summer we are planning to discuss the candidates for new events with Russian promotions. I am sure that the fighters recommended by Black House will show great results. We are also aware that joint training is a rewarding professional experience for our fighters and trainers. 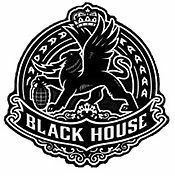 The first Master Class for our team will be held by Black House wrestling coach Kenny Johnson in September”. 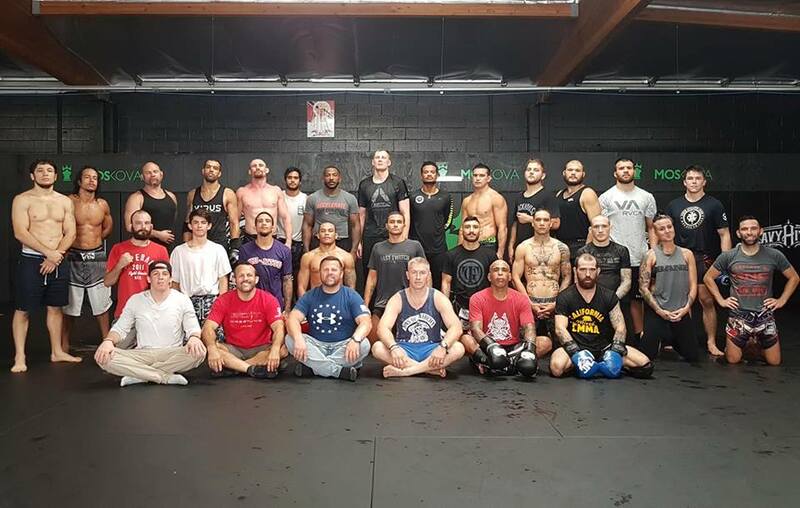 About Black House MMA: MMA club and gym located in Los Angeles (USA). Founded by Carlos "Carlão" Barreto, Jorge Guimaraes and Rogerio Camoes. Provides a place for training for world level champions, such as Lyoto Machida, Anderson Silva, Junior dos Santos and many other legendary fighters. 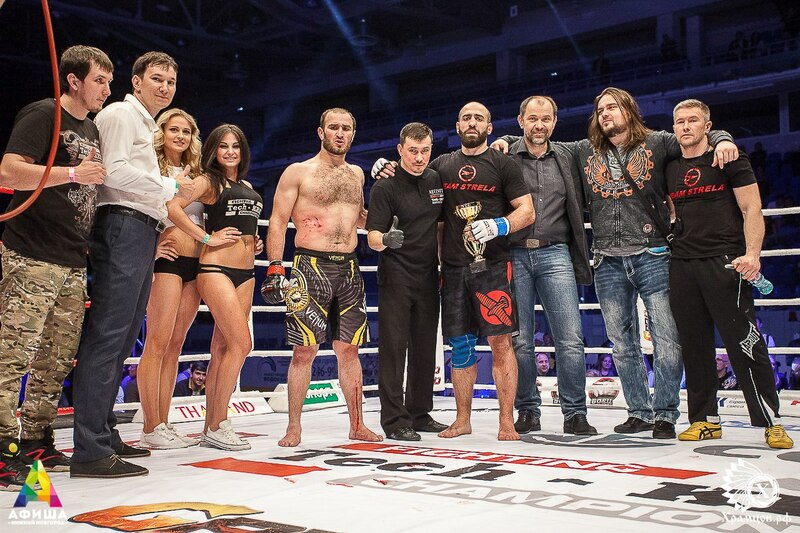 About Strela Promotion: one of the leading MMA club in Russia, founded by Taras Kiyashko and Ivan Bannikov. 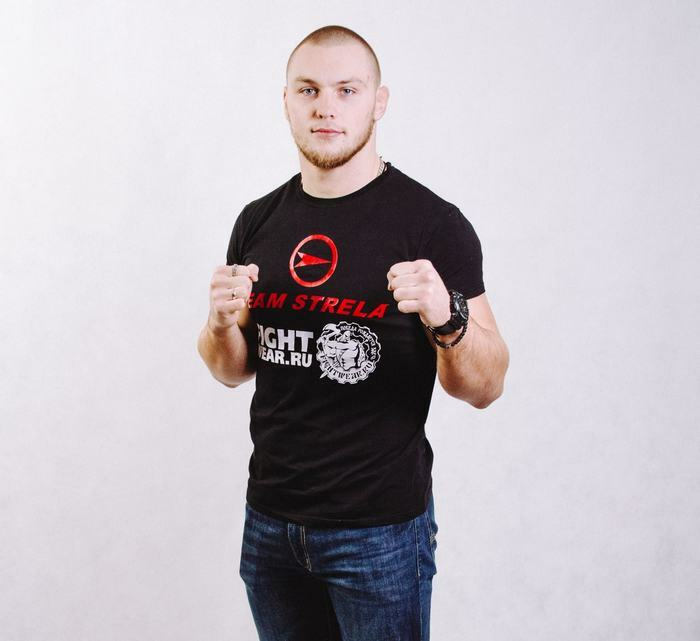 The list of the fighters, whose professional career is promoted by Strela Promotion, includes the following champions: Alexander Volkov, Mikhail Zayats, Alexey Efremov, Giga Kukhalashvili and others. Alexander Volkov knocked out his rival Attila Vegh in the first round. Our congratulations to him ! 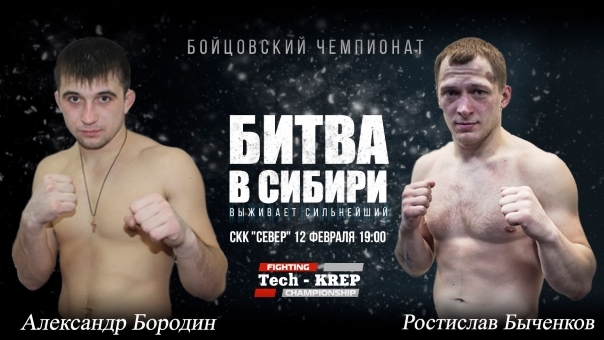 Alexander Volkov (Strela Promotion) will fight an M-1 Challenge champion title bout against Attila Vegh (MMA Spirit). M-1 Challenge heavyweight-champion title bout. 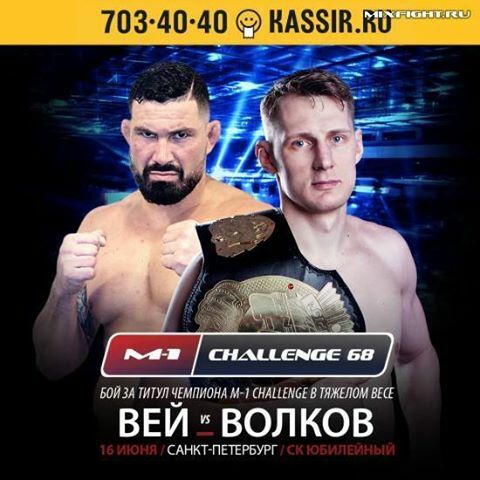 Alexander Volkov will fight his first bout to defend his M-1 Challenge heavyweight champion title in St Petersburg on June 16. Attila Vegh (Slovakia) will be his rival in this duel. The bout will take place in the Nagorny Palace of Sports at 7:00 p.m. in Nizhny Novgorod. 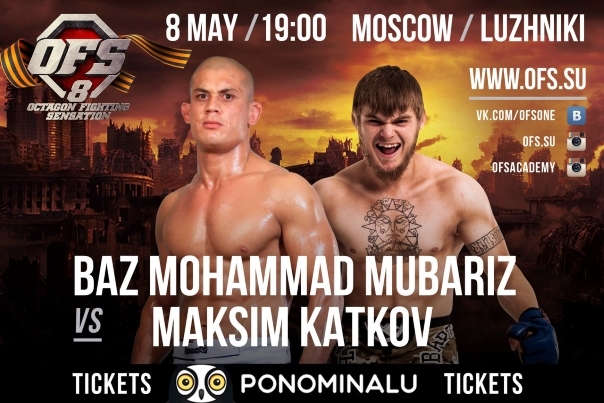 On May 8, a mixed-martial-arts OFS-8 Day of Victories tournament will be held in Luzhniki, Moscow. Both belong to lightweight category and have already met earlier at the OFS tournaments. The 18th international tournament Grand Prix Akhmat-2016 in mixed martial arts took place at the Sports Hall Coliseum in the city of Grozny, Russia, on the 9th of April. 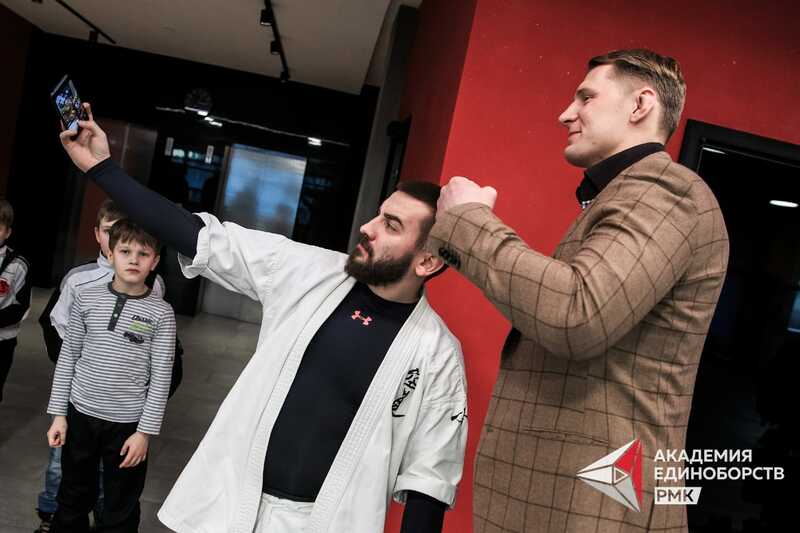 The second edition of the Akhmat MMA Grand Prix attracted leading fighters from Russia and other countries, such as Brazil, USA, Canada, the Netherlands, Croatia, Poland, France, Greece, Cyprus, UK and Ukraine. 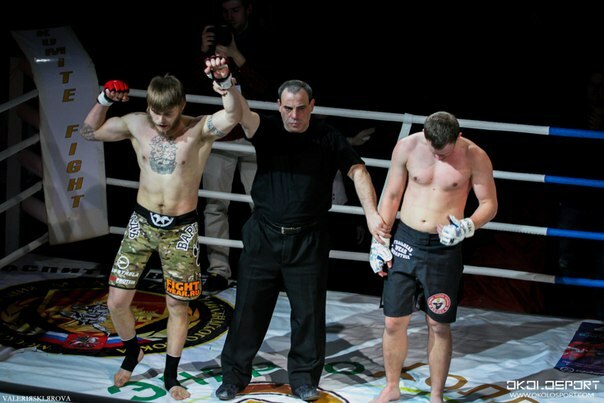 Alexey Efremov from Strela Team (MMA Division) defeated Sergio Souza via TKO (Punches) – Round 1, 1:53. November 14th, "Global Fight Gym"
17.30 - 20.00, topic "Choking"
13.00 - 16.00, topic "Back mount"
Aleksey Efremov won in the first round by TKO. Big summer camp in grappling and Brazilian jiu-jitsu in the Altai Mountains 2016! Today, 24 October Aleksandr Volkov, our team athlete, has his birthday!